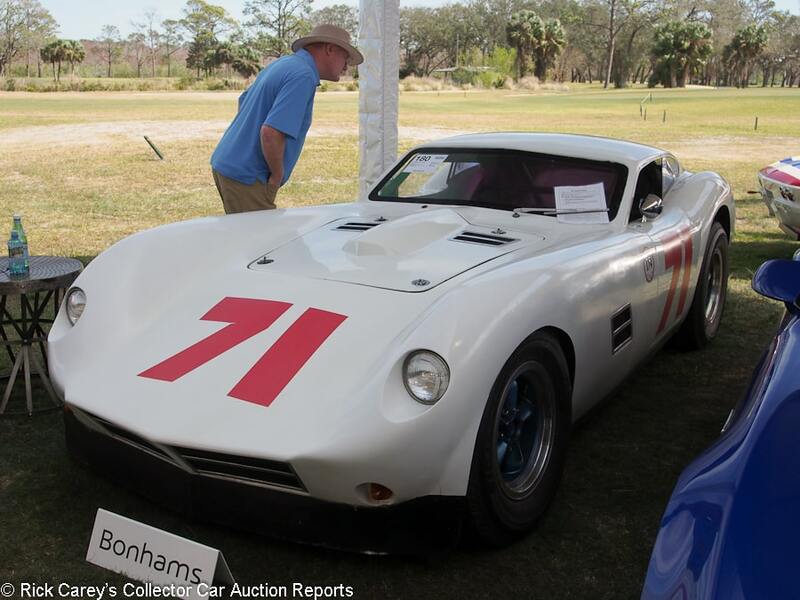 2018 marked Bonhams fourth year across Fernandina Beach Boulevard from runway 13/31 at Fernandina Beach Municipal Airport (FHB). The runway is closed for the duration of the auction, much to the relief of auction staff and attendees saved from ducking during the approach and runup before departure of the Citations and Gulfstreams of the glitterati coming and going for the Amelia Island Concours d’Elegance. Next year another corner of the airport will be shared with Russo and Steele, adding yet another auction to the already frenetic Amelia Island schedule. Bonhams has built itself a strong presence in Amelia based on solid cars, realistic estimates and the efforts of its enthusiastic and informed specialists. Anyone wanting to know why a particularly esoteric car works needs only to come here and ask. The explanation will be informed and lucid. Bonhams missed this year on its highest profile sale (a distinction not alone among the Amelia auctions), the Ferrari Daytona Spider. The highest sale was only three years old, the McLaren P1, also a characteristic shared with its Amelia counterparts along with an overweight of Porsches. Sixteen of the 101 lots offered were from Stuttgart, 12.2%, and all but one of them sold, a 93.8% sell-through when Porsches were the flavor of the week, like boiled shrimp at Fernandina Beach restaurants. There is a benefit from being first. 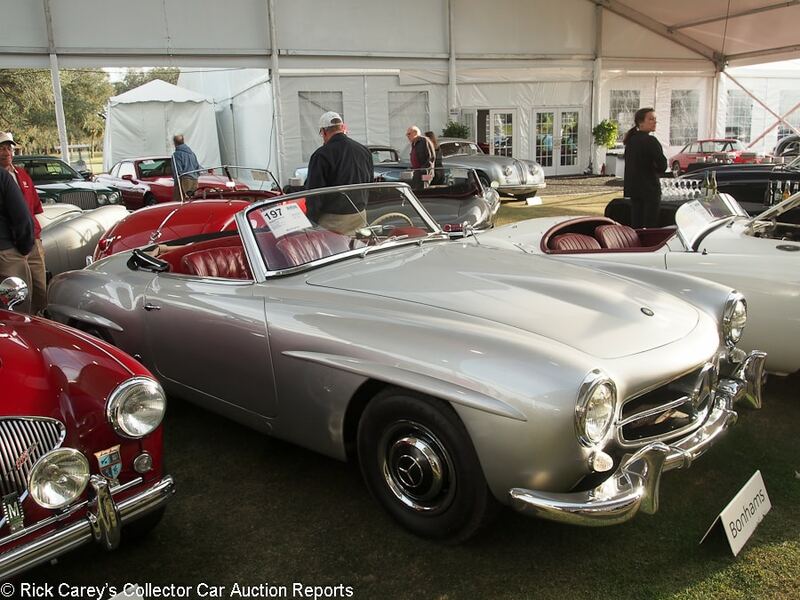 Enjoy the 53 cars reported below, even though there were several equally intriguing, rare cars we missed before the concours was rescheduled to Saturday to avoid Sunday’s threatening weather report that took a day out of the preview schedule. The cars reported were viewed on-site and described by me, Andrew Newton and Greg Ingold; the final copy and comments are my responsibility. Cars are sorted by Marque, Model, Body Style and Year for easier review. 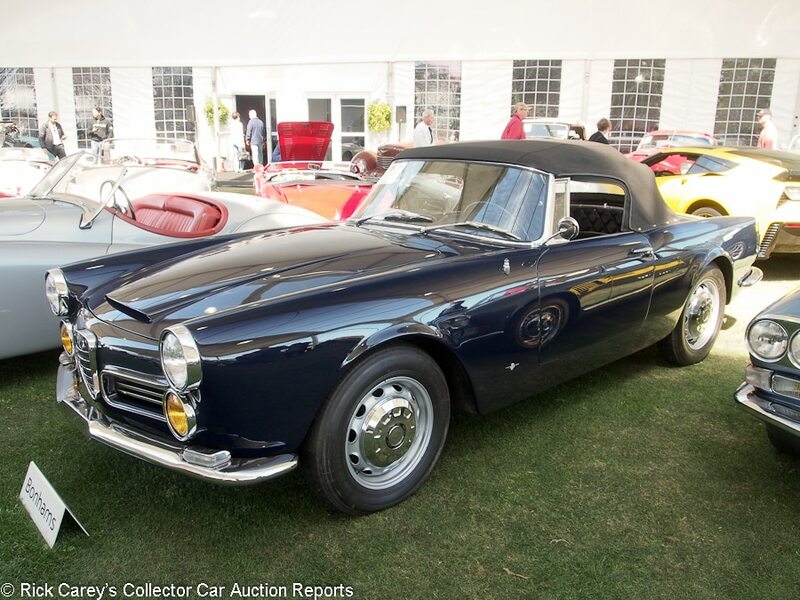 Lot # 178 1963 Alfa Romeo 2600 Spider, Body by Touring; S/N AR191503; Dark Blue/Dark Blue leather; Black cloth top; Estimate $125,000 – $175,000; Visually maintained, largely original, 3- condition; With Reserve; Hammered Sold at $99,000 plus commission of 12.00%; Final Price $110,880. – Becker Europa II AM-FM, 5-speed, silver steel wheels, hubcaps, Michelin tires, stainless steel exhaust – Sound older repaint and chrome. Surface creased upholstery, very good top. The engine has been done and converted to Spanish Webers. Paint crack at the front of the driver’s door. The engine compartment isn’t restored and has been quickly painted over old, peeled paint. An indifferent driver with a noted tick from the engine. – If the tick is valve adjustment (as it probably is) all is right with the world; if it’s something else there’s going to be a big bill in its future. Either way a realistic price was paid for it. Lot # 177 1954 Allard K3 Roadster; S/N K33261; Engine # 526208987; Light Blue/Red leather; Estimate $125,000 – $150,000; Older restoration, 3+ condition; With Reserve; Not sold at Hammer bid of $85,000. – 331/230hp Cadillac V8, automatic transmission, louvered hood, flip-up fuel caps in left and right rear fenders, side exhaust, chrome wire wheels, narrow whitewall all season tires. – Good older paint and brightwork. Light wear underneath. Very lightly worn seats but mostly good interior. A lightly aged older restoration and good enough. These are so rare that you can’t really be picky when shopping for one. Rare automatic, but Allards can be such a handful to drive that an auto might not be such a bad thing. – Sold at RM Arizona in 2012 for $57,500 and then at Bonhams Greenwich in 2015 for $88,000. Allards haven’t exactly become the next hot thing over the past three years and this car is in essentially the same condition it was in at Greenwich, so the reported high bid should have been sufficient to see the car change hands. Lot # 174 1913 American Underslung Model 34A Tourist 4-Passenger Touring; S/N 4558; Light Grey, Black accent/Burgundy leather; Black cloth top; Estimate $200,000 – $275,000; Older restoration, 1- condition; With Reserve; Hammered Sold at $172,000 plus commission of 12.00%; Final Price $192,640. – RHD. 38-inch wood spoke wheels, American speedometer, bulb horn, C.M. Hall headlights, Gray & Davis sidelights, dual rear-mounted spares. – Very good paint, upholstery, top and nickel trim. Not freshly restored but done to high standards with limited use since it was done with recent concours showings including Best in Show American at Keels and Wheels in 2017. More dusty than used. – The body on this Underslung has been reproduced, a fact that many, if not most, of its counterparts over a century old face. Its recent concours success shows the quality of the restoration completed ten years ago. It needs nothing more than a careful dusting and brought a price that is fair to both the buyer and the seller. 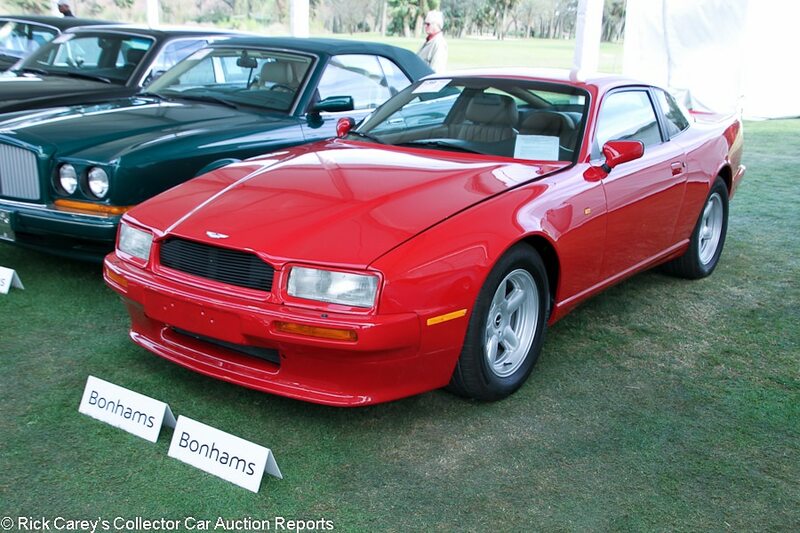 Lot # 139 1992 Aston Martin V8 Virage Coupe; S/N SCFCAM2S5NBL50303; Red/Tan leather piped in Black; Estimate $60,000 – $80,000; Visually maintained, largely original, 3 condition; No Reserve; Hammered Sold at $49,000 plus commission of 12.00%; Final Price $54,880. – 5,340/330hp V8, 5-speed, wood dash, CD stereo, power windows, air conditioning. – Showing 69,190 miles. A handful of tiny chips on the nose. Some big chips on the mirrors. Long scratch on the left rear wheel. Light wear to the driver’s seat but very good original interior. Slightly dirty engine bay. Significant mileage and not perfect, but still looks very good for a car of its age and use. Also represented as one of just 13 US market cars with a 5-speed, so it’s pretty rare. – Sold here two years ago for $46,200 and at the RM sale in Amelia back in 2009 for $42,000. No serious work seems to have been done over the past couple of years, so with some collectors’ attention turning to ’90s Astons more recently, this turned out to be a modestly successful trip for the consignor, who almost broke even after paying the commission. 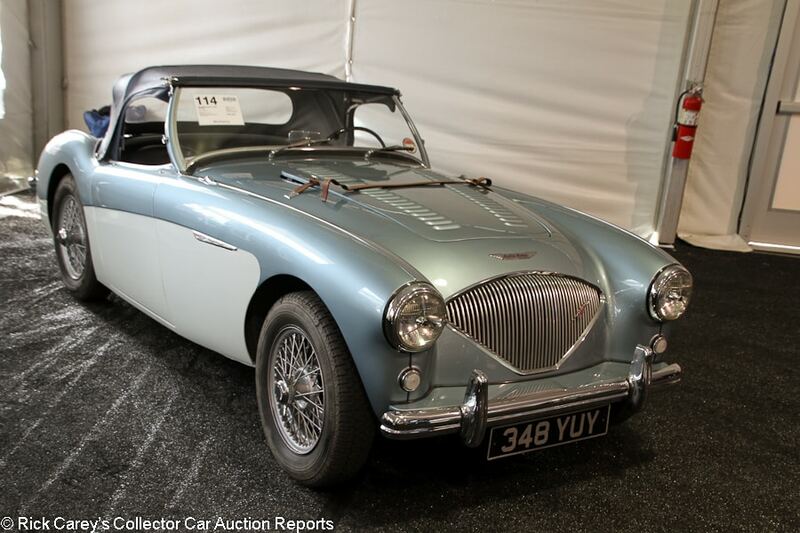 Lot # 114 1955 Austin-Healey 100/4 Roadster; S/N BN1L222880; Engine # 1B222880; Healey Blue, White/Dark Blue; Dark Blue vinyl top; Estimate $100,000 – $125,000; Modified restoration, 2- condition; No Reserve; Hammered Sold at $80,000 plus commission of 12.00%; Final Price $89,600. – Painted centerlock wire wheels, Michelin XZX tires, banjo steering wheel, overdrive, 4-speed from a later BN2, upgraded to Le Mans specs in period, later upgraded to JME Healeys ‘Fast Road Specifications’ with an aluminum cylinder head, high compression pistons, lightened flywheel and front disc brakes – Recent engine rebuild. BMIHT Certificate. Old tires. Light wear but restored underneath. The front bumper doesn’t quite fit straight. Good older paint. Uneven gaps. Lightly worn restored interior. Not a show car, but still attractive and ready for vintage rallies and other events. – Appropriately discounted for the age of its restoration and the many modifications that make it a much better tour car but less appealing to purists. It is a lot of style and usability for the money. 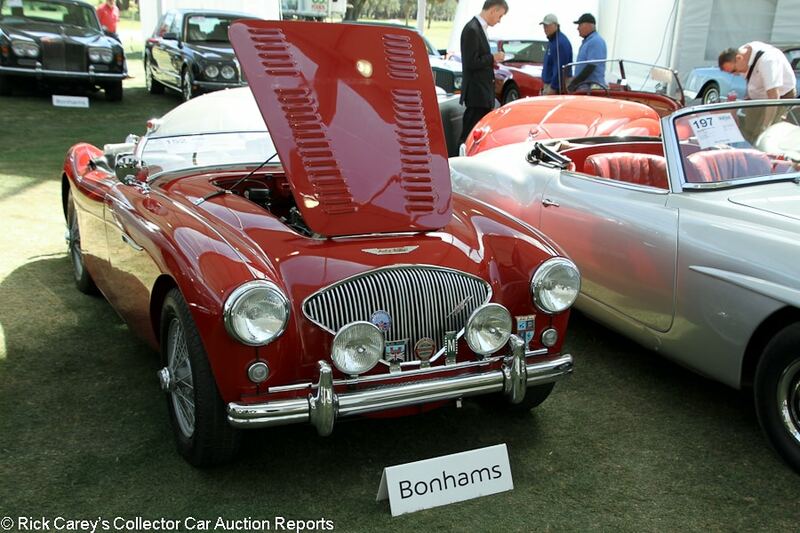 Lot # 152 1956 Austin-Healey 100/4 Roadster; S/N BN2L229979; Engine # 229979; Reno Red/Black piped in Red; Estimate $70,000 – $90,000; Older restoration, 2- condition; No Reserve; Hammered Sold at $55,000 plus commission of 12.00%; Final Price $61,600. – Painted centerlock wire wheels, dual mirrors, Lucas driving lights, badge bar, boot cover, overdrive, front disc brakes (original drum brakes included) woodrim steering wheel, upgraded to Le Mans specs, BMIHT documented and 100 Le Mans registered. – Worn seats but mostly good interior. Very clean recently detailed engine bay. Matching numbers. Older paint with a few blemishes on the nose. Delaminating windshield. First restored in the 1980s, when it was fitted with Le Mans upgrades, then mechanically overhauled about seven years ago. A solid older restoration that would make a great event car. – Sold by Auctions America in Ft. Lauderdale in 2015 for $73,700. A handsome and usable Healey, it nevertheless wasn’t a BN2 Le Mans in period and the price here is appropriate for the standard BN2 it left the factory as. The extra performance and style are a bonus. 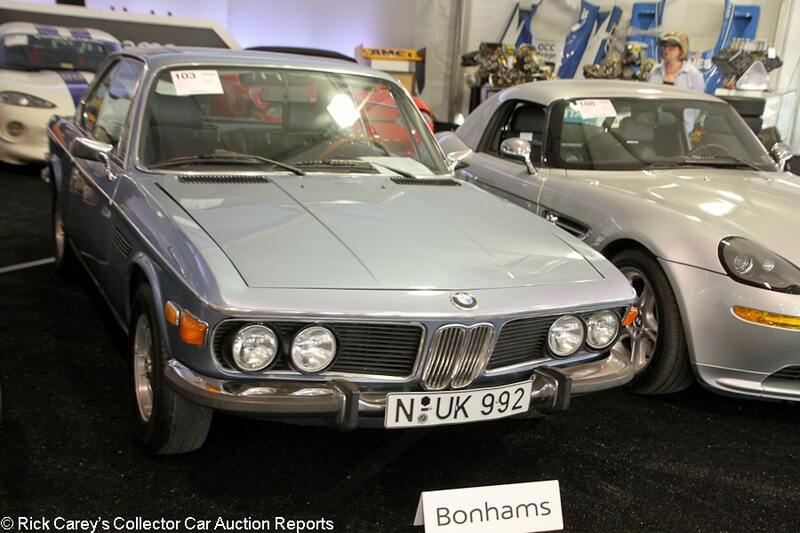 Lot # 103 1972 BMW 3.0CS Coupe; S/N 2250289; Engine # 2250289; Fjord Blue/Dark Blue cloth; Estimate $50,000 – $60,000; Visually maintained, largely original, 2- condition; With Reserve; Hammered Sold at $36,000 plus commission of 12.00%; Final Price $40,320. – 4-speed, alloy wheels with hub caps, sunroof, woodrim steering wheel, power windows, wood dash, clock, later CD stereo, air conditioning. – Unrestored but well maintained and cleaned up engine bay. Slightly dull but forgivable brightwork. Very good repaint. Dull switchgear but mostly very good interior. Some road wear underneath, but mostly tidy. Showing 61,295 believable miles. All original other than a repaint, rebuilt air conditioning system and conversion to 4-speed gearbox. Most of these E9s have long since rusted away and some of the unrestored ones out there still have some lurking underneath. For a totally original one to be this good is pretty remarkable. – Prices for the CS, CSi and CSL have been creeping up over the past few years and solid examples of even the CS have gotten a bit pricey. This result could even be considered a bargain considering its level of preservation, but mostly it’s a sound value in a preserved largely original example with a decent repaint. Lot # 136 1969 Chevrolet Camaro Z/28 2-Dr. Hardtop; S/N 124379N608272; Fathom Green, White Stripes/Midnight Green vinyl; Estimate $80,000 – $100,000; Recent restoration, 2- condition; No Reserve; Hammered Sold at $61,000 plus commission of 12.00%; Final Price $68,320. – 302/290hp (400+ dyno hp), 4-speed, Hurst shifter, power brakes, chambered exhaust, Rally wheels with Firestone Sport Car 200 tires, radio delete, center console with gauge pack. – Excellent paint. The passenger’s door is misaligned slightly. The brightwork is all in very good condition. The engine and underbody have been fully restored. The interior appears fresh with no noticeable wear. A fairly fresh looking restoration with very few tweaks needed and represented as 75,705 miles from new. 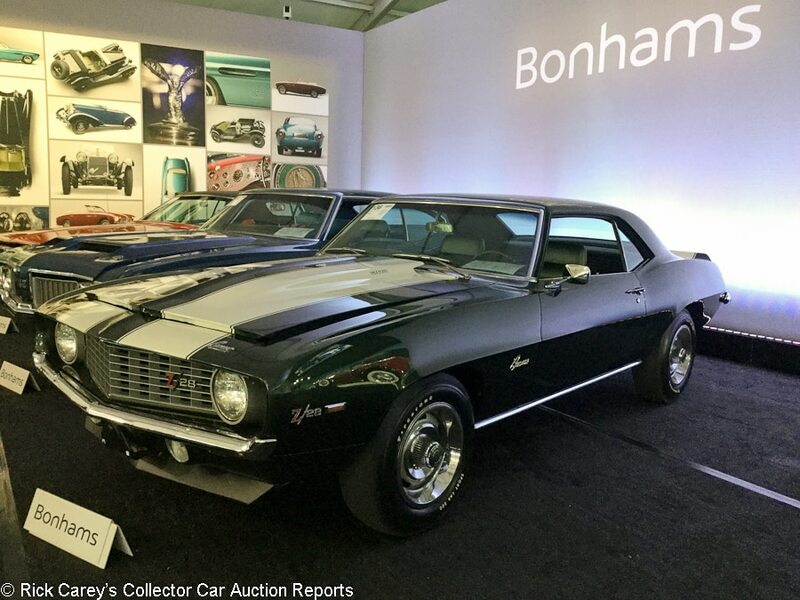 – The Bonhams bidders were a little reluctant to pay full retail for this Z/28 which didn’t provide any assurance of the originality of the engine, just that it’s a DZ code and this result is a realistic compromise between the quality of the presentation, the mileage represented and the engine’s uncertainty. That will not inhibit the joy of driving it, nor the ebullient burble of the chambered dual exhaust system. Lot # 191 1964 Chevrolet Corvette Roadster; S/N 40867S106655; White, Red, Blue scallops/Black; Estimate $100,000 – $150,000; Competition restoration, 3+ condition; With Reserve; Not sold at Hammer bid of $80,000. – 331 Traco V-8, Rochester fuel injection, rollbar, modern vintage race equipment, matte black side exhausts, Grey 8-spoke alloy wheels, full width Plexiglas windscreen. – Excellent paint. Engine and chassis are orderly but older. Impressive history of autocross championships from 1964-69, then road raced 1970-72 with 15 class wins out of 26 races, 4 overall wins. Ex-Bill Jobe ‘Supernova’ race car restored to 1971 appearance. – Offered at Fall Auburn last September with a wholly irrational reported high bid of $275,000 and brought here with a more realistic estimate and even more realistic bid. The mis-match between the consignor’s expectations and the car are still highlighted, but are getting closer to reality. 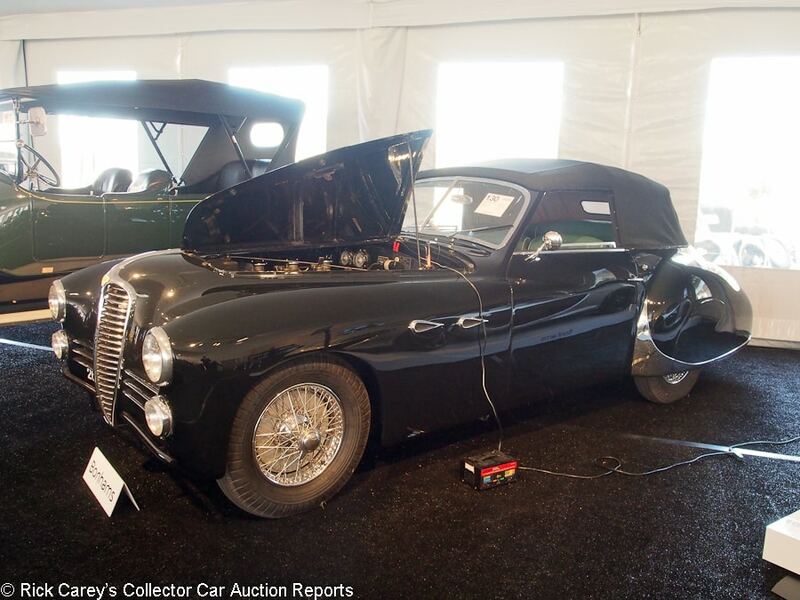 Lot # 130 1950 Delahaye 135M Cabriolet, Body by Saoutchik; S/N 801746; Black/Green leather; Black cloth top; Estimate $300,000 – $400,000; Cosmetic restoration, 3 condition; With Reserve; Hammered Sold at $300,000 plus commission of 11.67%; Final Price $335,000. – RHD. Chrome wire wheels, Dunlop tires, three Solex carbs, Blaupunkt radio, skirts, power top, power windows – Sound paint, upholstery, top and chrome. The chassis and engine compartment are unrestored but orderly. A driver quality Delahaye. – A seductive Saoutchik design of this time that disguised the bulk of the tall 6-cylinder engine in beautiful envelope bodywork and dramatic teardrop rear fenders with chrome gravel shields and skirts. Its rather European combination of good cosmetics with unrestored but maintained engine and chassis is a little disappointing to some U.S. buyers but resulted in a thoughtful compromise in the final price between the buyer and the seller. Lot # 121 1972 Dodge Charger SE 2-Dr. Hardtop; S/N WP29U2A187279; Hemi Orange, Black vinyl roof/Black; Black top; Estimate $50,000 – $80,000; Visually maintained, largely original, 3+ condition; No Reserve; Hammered Sold at $38,000 plus commission of 12.00%; Final Price $42,560. – 440/280hp, power steering and brakes, air conditioning, Rallye wheels with Goodyear Polyglas GT tires, bucket seats and console, AM/FM radio, includes broadcast sheet. Originally sold at Mr. Norm’s Grand Spaulding Dodge. – Represented as 16,871 miles from new. The paint is very good with no obvious faults. The front bumper has a few minor scratches and the brightwork has been well cared for. The engine and underbody are aged and dull. The interior is generally good with some minor wear to the driver’s seat. Represented as an original car, although the paint does not look original. The cosmetics are excellent but the mechanicals are more aged than the exterior would suggest. 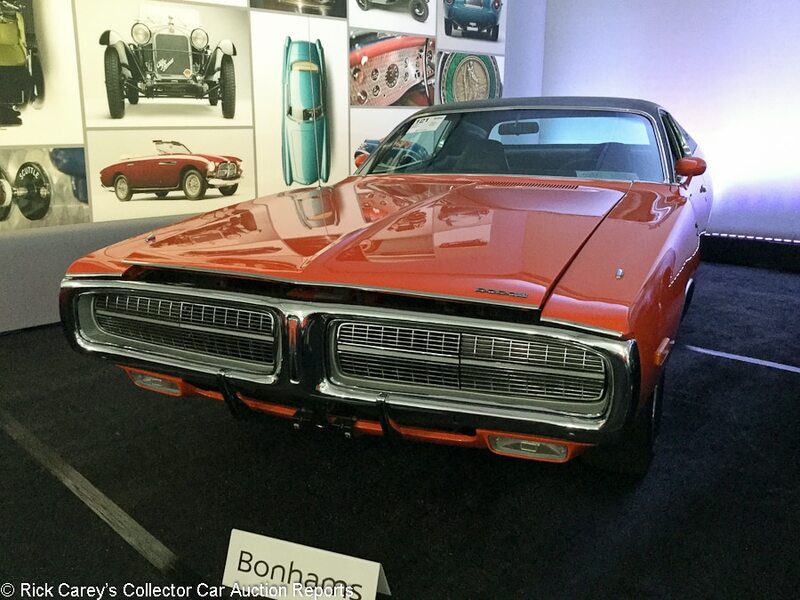 – This Charger SE is surprisingly comprehensively optioned and was obviously intended as a street cruiser, not a drag strip charger, with enough power from the base 440 engine (just 280hp in ’72) to offset the weight and drag of all the power assists and A/C. The extensive equipment is a real plus for a modern collector and the price reflects that as well as the care it has received and extensive originality. A Viper Pit. 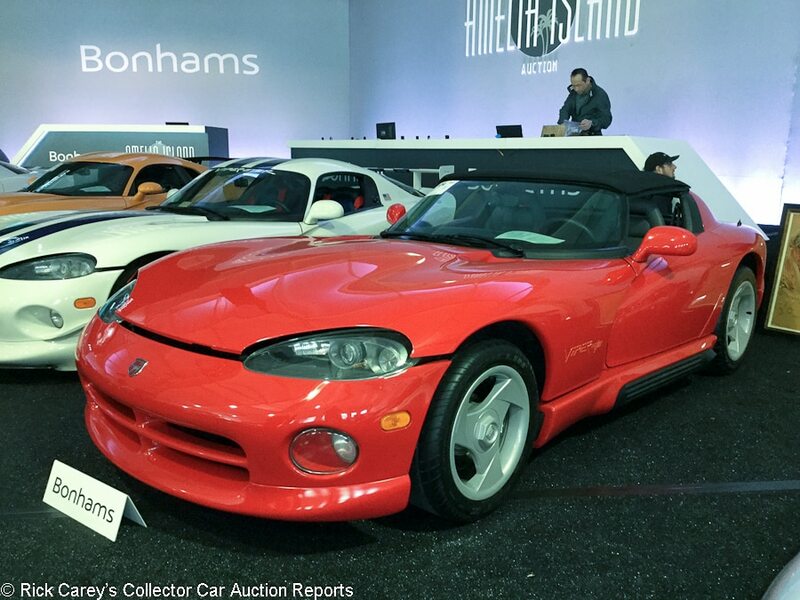 So many Vipers in one auction is difficult to attribute to serendipity, but Bonhams distributed them throughout the auction from Lot #102 to Lot #200, making it difficult for Viper Charmers to stay focused through the long day. 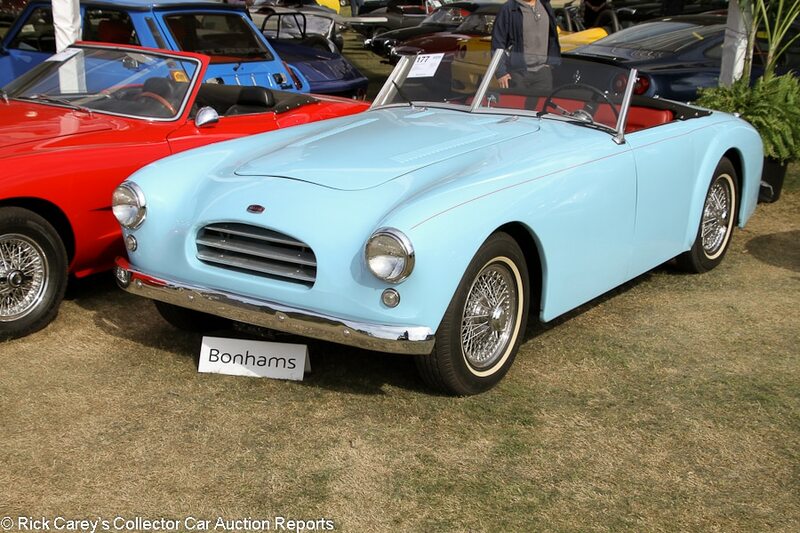 Bonhams concentrated its classics mid-auction, but not its Vipers. 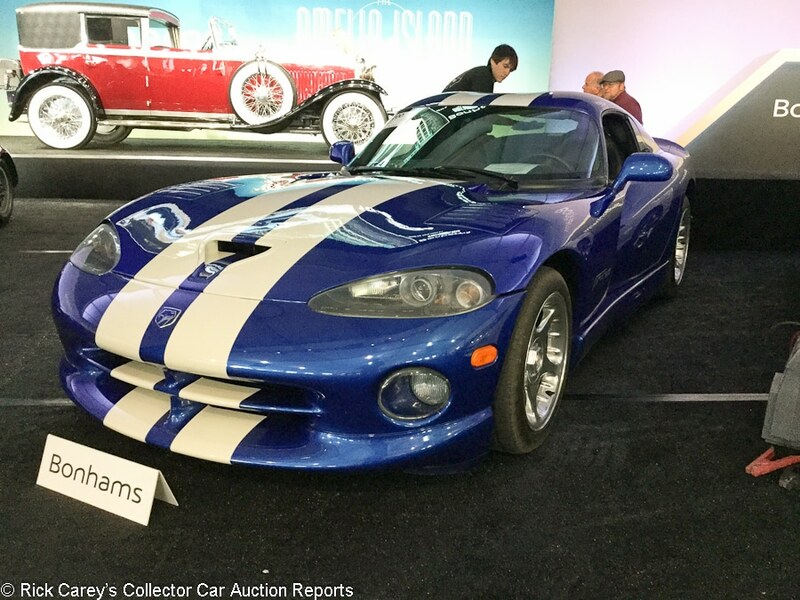 Lot # 200 1996 Dodge Viper GTS Coupe; S/N 1B3ER69E5TV201107; Viper GTS Blue, White stripes/Black leather; Estimate $35,000 – $50,000; Unrestored original, 2- condition; No Reserve; Hammered Sold at $51,000 plus commission of 12.00%; Final Price $57,120. – CD stereo, power windows. – One-owner car showing 2,978 miles from new. Very good paint and body with no significant signs of use. The interior is very good with only stretching to the driver’s seat to indicate use. A nearly like new car. 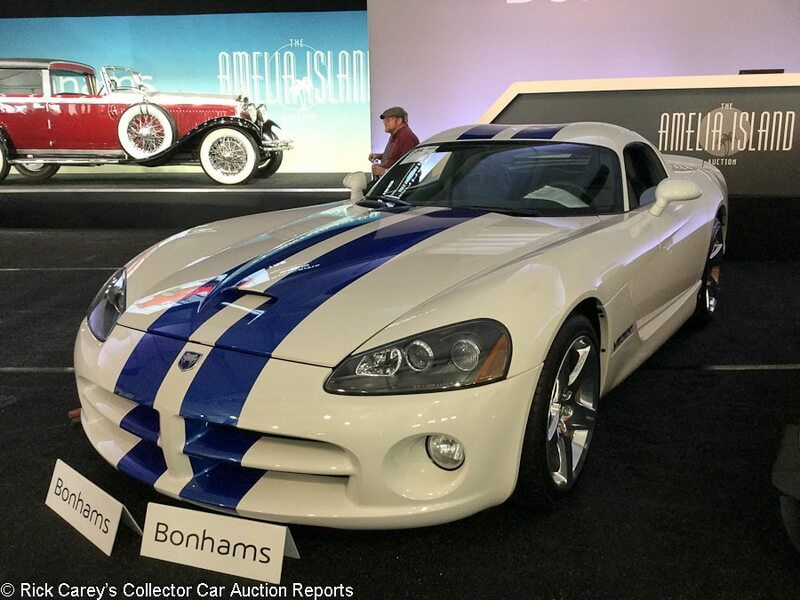 – Sold by Mecum at Kissimmee in 2017 for $82,500, while this is considerably less it is another strong result for a like-new Viper that beat Bonhams’ conservative presale estimates. At this price and mileage, it’s likely headed for a life in collections and little if any hard driving. 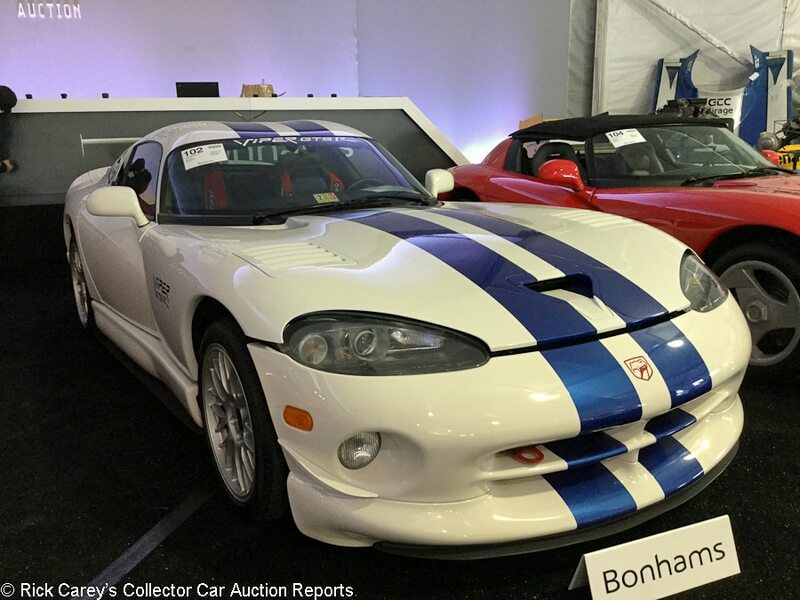 Lot # 102 1998 Dodge Viper GTS-R Coupe; S/N 1B3ER69E4WV401030; White, Blue Stripes/Black, Blue; Estimate $30,000 – $40,000; Unrestored original, 2- condition; No Reserve; Hammered Sold at $81,000 plus commission of 12.00%; Final Price $90,720. – Racing harnesses, CD stereo. – Very good paint and body. The driver’s seat has some stretching. Otherwise, it’s a like new car showing 9,967 miles represented to be as from new. – Sold for $88,000 at Mecum Monterey in 2016. The original list price for this car was about 85 grand, and while good early Vipers have been getting surprisingly strong prices at auction lately, they haven’t fully taken off yet. At the same time, though, they’re no longer used cars, as this strong result indicates. Lot # 104 1993 Dodge Viper RT/10 Roadster; S/N 1B3BR65E2PV200706; Red/Gray leather; Black cloth top; Estimate $20,000 – $30,000; Unrestored original, 2 condition; No Reserve; Hammered Sold at $38,000 plus commission of 12.00%; Final Price $42,560. – Cassette stereo. – Excellent paint, body, mechanicals and interior. Showing 583 miles. Like new – An early RT/10 with the blocky wheels, side exhaust and almost total lack of creature comforts, the raw essence of Viper-ness. Vipers have started getting attention and low-mile ones have started popping up more at auction, although prices have been just creeping up rather than exploding. Even at this top dollar result for this RT/10, it’s still a lot of car for the money but things may not be that way for much longer. It was sold for $47,580 at Leake’s OK City auction in 2014, not auspicious for things to come, value-wise, but like ’53-’53 Corvettes this is the core of Viper history. Lot # 165 2015 Dodge Viper SRT TA 2.0 Coupe; S/N 1C3ADEAZ9FV510303; Brilliant Dozer/Black; Estimate $70,000 – $90,000; Unrestored original, 2 condition; No Reserve; Hammered Sold at $82,000 plus commission of 12.00%; Final Price $91,840. – Front splitter, rear spoiler, Brembo brakes. – Hardly used and in like new condition, showing 2,324 miles. – Other than the aero bits and special wheels, the TA 2.0 is distinguished from the normal production Viper by beefier suspension and other handling bits. When the TA was fresh from the factory, Dodge slashed prices to encourage sales and this car could have been had for barely $100,000. While this car is only a few years old and wasn’t an instant collectible, it’s holding its value reasonably well with a $94,600 result at Mecum Monterey in 2016 and a few grand less here. Lot # 184 2006 Dodge Viper SRT-10 VOI.9 Edition Coupe; S/N 1B3JZ69Z86V101816; White, Blue Stripes/Black; Estimate $35,000 – $45,000; Unrestored original, 2 condition; No Reserve; Hammered Sold at $57,000 plus commission of 12.00%; Final Price $63,840. – VOI.9 Edition, #97 of 100 – Built for the 2006 Viper Owners International gathering. Excellent paint, body, mechanicals and interior. A like new car with 677 miles. – 100 of these special edition Vipers were built, but it was essentially a cosmetic package with unique paint and interior details. 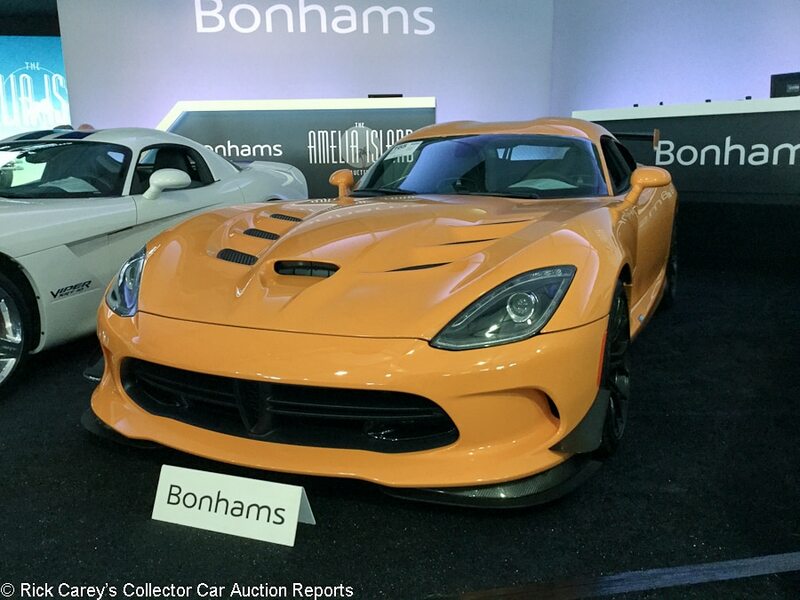 Bonhams’ presale estimates on the group of Vipers that sold here were surprisingly low, so this result isn’t as surprising as it seems when you compare it to the estimate or to the price of $80,300 it brought at Mecum’s Dallas auction in November 2016. It is fair money for a car that hasn’t really started appreciating yet but will down the road. 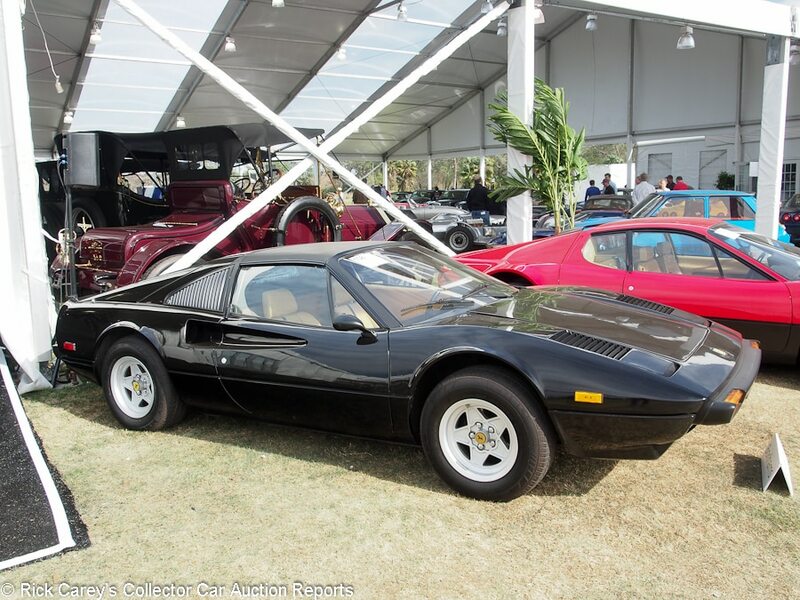 Lot # 108 1978 Ferrari 308 GTS Spider, Body by Pininfarina-Scaglietti; S/N 26567; Black/Beige leather, Black stripes; Estimate $60,000 – $80,000; Visually maintained, largely original, 4+ condition; No Reserve; Hammered Sold at $50,000 plus commission of 12.00%; Final Price $56,000. – Alpine CD stereo, Borletti air conditioning, power windows, alloy wheels, Michelin MXV4 tires. – The odometer shows 15,799 miles, which probably are original. It has a cracked old repaint. Good interior. Bubbles at the base of the right windshield post. Original undercoating in the wheelwells. A full repaint is in this 308’s future, as is a full service. It is not for the faint of heart, or the light of pocketbook. 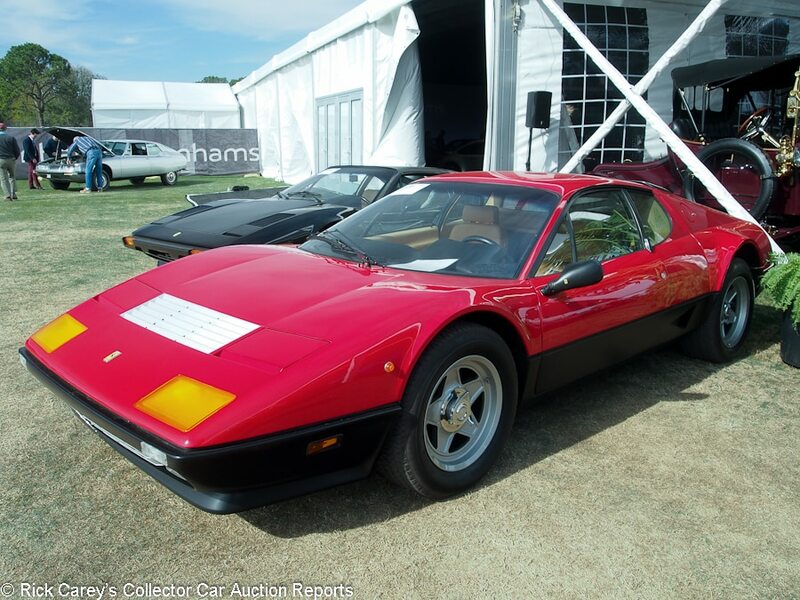 – The seller wisely put this 308 GTS in without reserve (albeit thoroughly arm-twisted by RM’s specialist) and took what came out of the audience. In fact given the visible and inferred shortcomings it is something of a generous price which will be subsumed by the service that is long overdue before even starting to deal with the alligatored paint and rust bubbles. The price paid is more than fair to the seller. 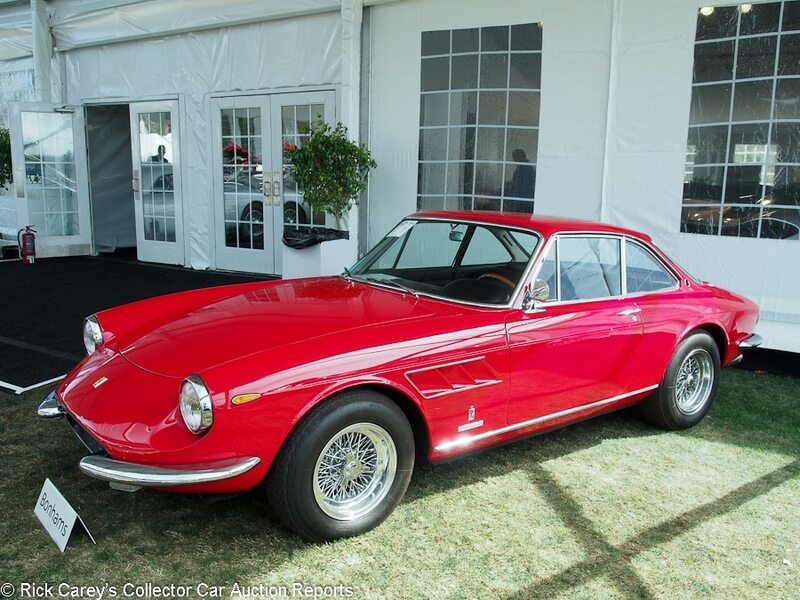 Lot # 167 1968 Ferrari 330 GTC Coupe, Body by Pininfarina; S/N 11427; Engine # 11427; Red/Black leather; Estimate $550,000 – $750,000; Visually maintained, largely original, 2- condition; With Reserve; Hammered Sold at $491,000 plus commission of 11.02%; Final Price $545,100. – Borrani wire wheels, Michelin XWX tires, woodrim steering wheel, later Blaupunkt cassette stereo, factory air conditioning. – Good paint, chrome and interior. Clean and orderly but not restored engine compartment and underbody. Four inch scrape on the left beltline ridge above the front fender vent. An exquisite driver, but a driver nonetheless. – Sold by RM at London in September 2014 for $632,727. That was GBP 392,000 all-in at the time, GBP 350,000 hammer. This result is GBP 394,300 all-in, more reflecting the weak dollar than any trend in 330 GTC prices. It then sold at RM’s Monterey auction in 2015 for $715,000 and at Barrett-Jackson in Palm Beach in 2016 for $660,000, continuing the downward recent trend in 330 GTC prices seen in this result. 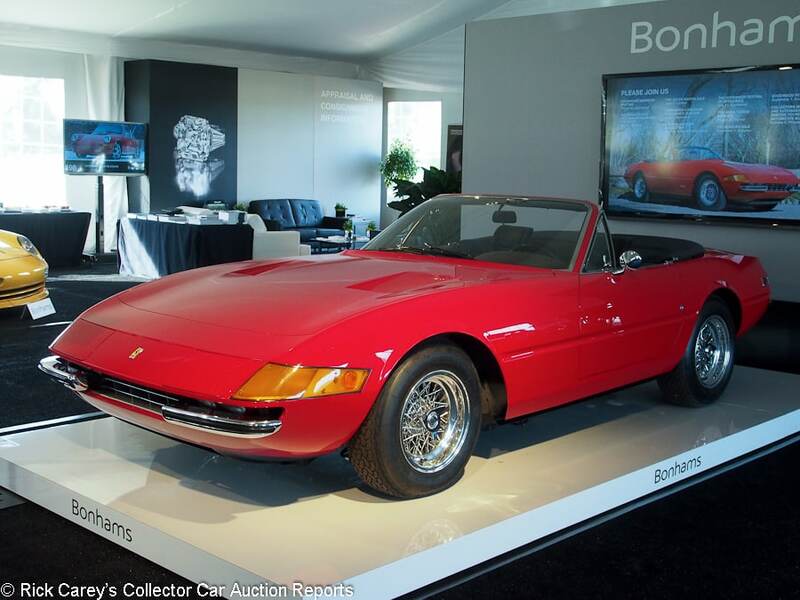 Lot # 137 1973 Ferrari 365 GTS/4 Daytona Spider, Body by Pininfarina-Scaglietti; S/N 16801; Engine # B2630; Red/Black leather; Black cloth top; Estimate $2,400,000 – $2,700,000; Older restoration, 2- condition; With Reserve; Not sold at Hammer bid of $2,200,000. – Becker Mexico AM-FM, power windows, chrome spoke Borrani wire wheels, Michelin XWX tires, painted nose panel, popup lights, Veglia air conditioning. – U.S. delivered new in the present colors. Restored like new in 1995 with excellent cosmetics and lovely interior with the original seat inserts, now aging gracefully and showing just 20,326 original miles. Original engine and denied Ferrari Classiche certification solely because its original U.S. side marker lights were removed in order to be operated legally in Europe. A sweet Daytona Spider that in reality needs absolutely nothing. – Sold by RM in Paris last February for $2,308,645, Euros 2,156,000 all-in and Euros 1,925,000 hammer at the time. The bid here is Euros 1,786,600 with today’s weaker dollar. The odometer shows 10 more miles than it did in Paris. The consignor may have been disappointed with this result but Bonhams sold another Daytona Spider at Scottsdale two months ago for $2.4 million hammer and it was a fresher restoration in better overall condition. 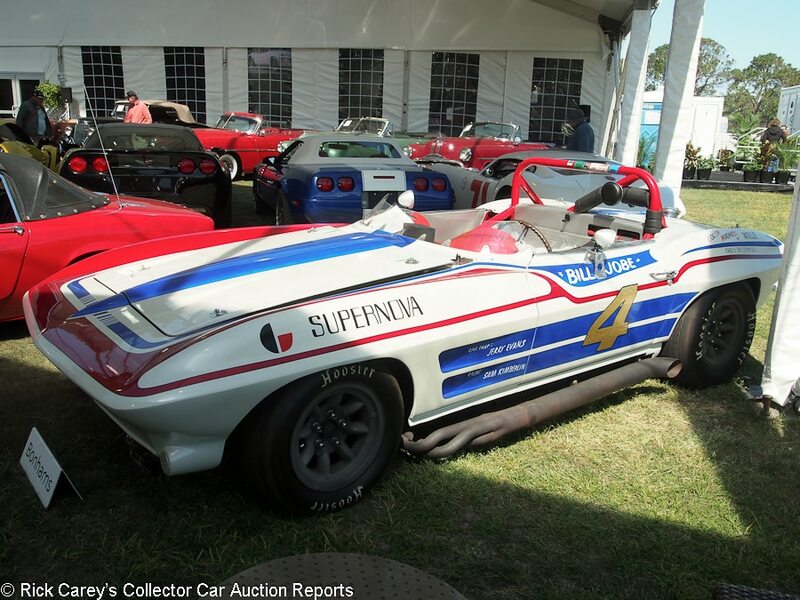 The $200,000 difference in bids is entirely appropriate to the condition of this Daytona Spider. Lot # 105 1981 Ferrari 512 BBi Coupe, Body by Pininfarina-Scaglietti; S/N ZFFJA09B000038713; Red, Black sills/Beige leather, Black bars; Estimate $325,000 – $400,000; Unrestored original, 2- condition; With Reserve; Not sold at Hammer bid of $280,000. – Borletti air conditioning, power windows, Pioneer cassette stereo, TRX tires. – Good original paint and lightly creased original upholstery. 2,665 miles from new. 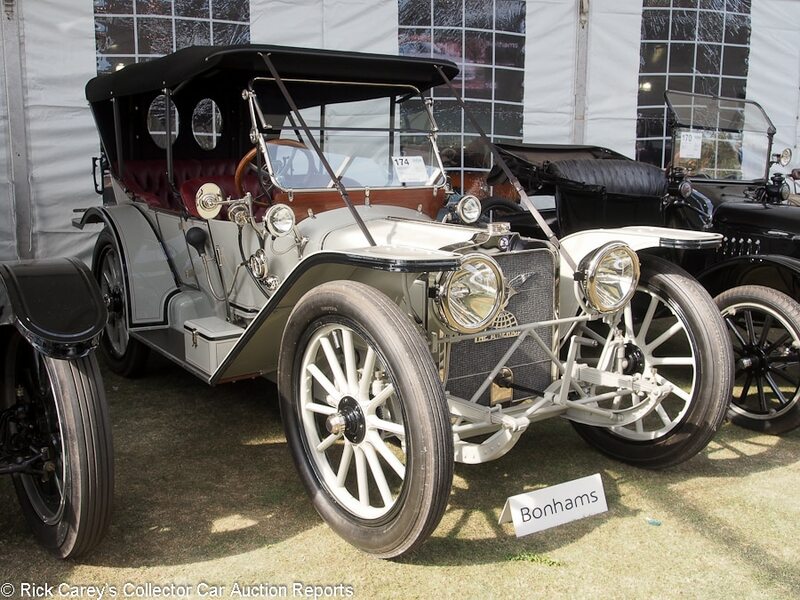 No evidence is offered of any recent service and Bonhams staff worked assiduously during the preview to get it running. – This might be a $300,000+ 512 BBi, but only with more evidence it has had some serious attention to its continuing maintenance. As it is, having apparently sat for years without being driven more than on and off an occasional transport van, it will enrich some Ferrari technician by six-figure numbers before it can be driven as intended by the factory. In its present situation it is an artifact, not an automobile, and the bidders were appropriately leery of it with this realistic bid. 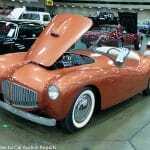 One of the curses of collector car auctions is consignors who deliver neglected non-running cars with gummy gas and no recent attention to be frantically fettled by the auction company. This is one of those cars, and it didn’t deserve to sell despite Bonhams best efforts. 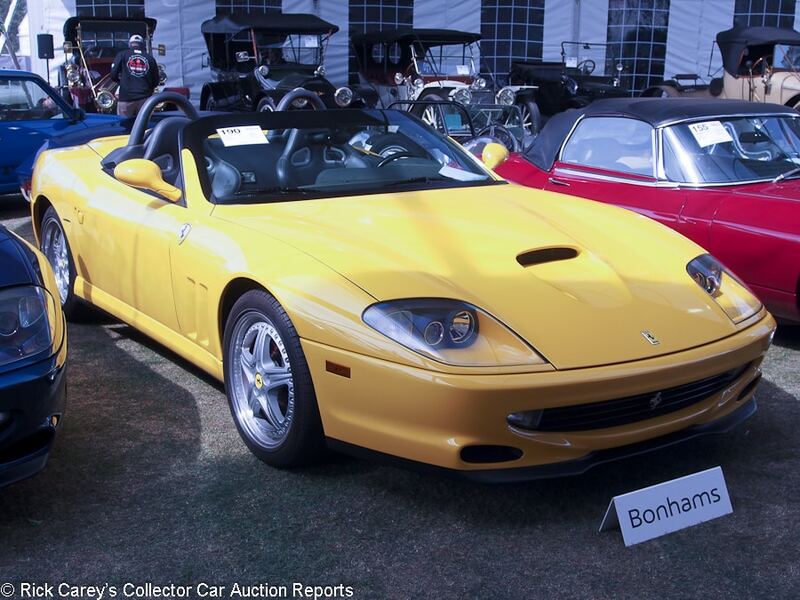 Lot # 190 2001 Ferrari 550 Barchetta Pininfarina Roadster, Body by Pininfarina; S/N ZFFZR52A810124147; Giallo Modena/Charcoal leather, yellow inserts; Estimate $430,000 – $490,000; Unrestored original, 2- condition; With Reserve; Hammered Sold at $405,000 plus commission of 11.23%; Final Price $450,500. – 6-speed, factory stereo, SF shields, Red calipers, modular wheels, Pirelli tires, Fiorano handling package, aftermarket exhaust system (original included), carbon fiber console. – U.S. delivery. Chipguarded nose. 9,953 miles and nearly like new. – This result is consistent with the somewhat variable recent results for 550 Barchettas, reflecting its 6-speed but also the rather high miles. 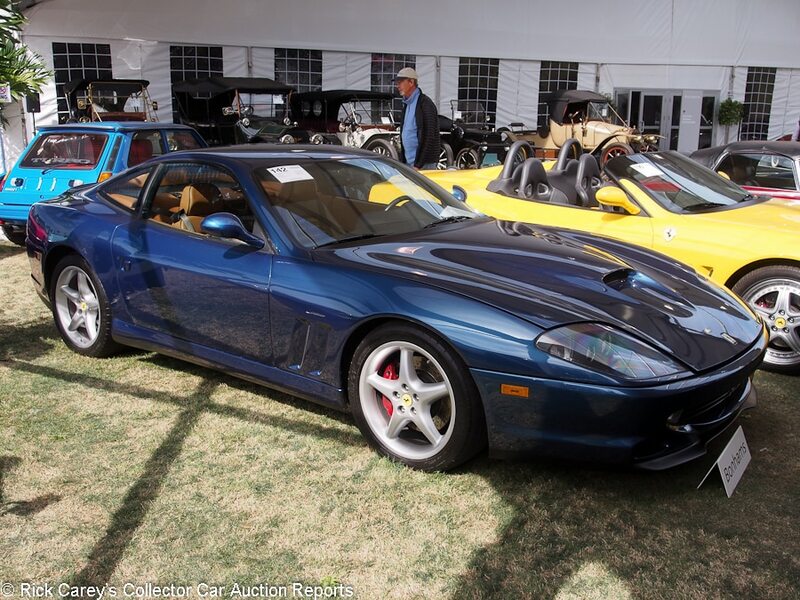 Lot # 142 2000 Ferrari 550 Maranello Coupe, Body by Pininfarina; S/N ZFFZS49A2Y0119587; Metallic Blue NART/Tan leather, Blue piping; Estimate $135,000 – $175,000; Unrestored original, 2- condition; No Reserve; Hammered Sold at $136,000 plus commission of 12.00%; Final Price $152,320. – 6-speed, air conditioning, red calipers, factory stereo, luggage, built-in radar detector, window sticker, service records from new, original books and pouch, complete tool kit, factory keys. – Three owners, miles from new, unblemished except for some light creasing of the driver’s seat cushion. The suitcase leather is a touch darker than the upholstery. Timing and accessory belt serviced in August 2017 – Carefully owned, maintained and driven by three owners from new, freshly serviced at a cost of $15,000, equipped with the desirable 6-speed manual gearbox and ready to be used, this is a quality 550 at a strong price that endorsed its many positive attributes. Just don’t drive it through Virginia with the built-in radar detector. 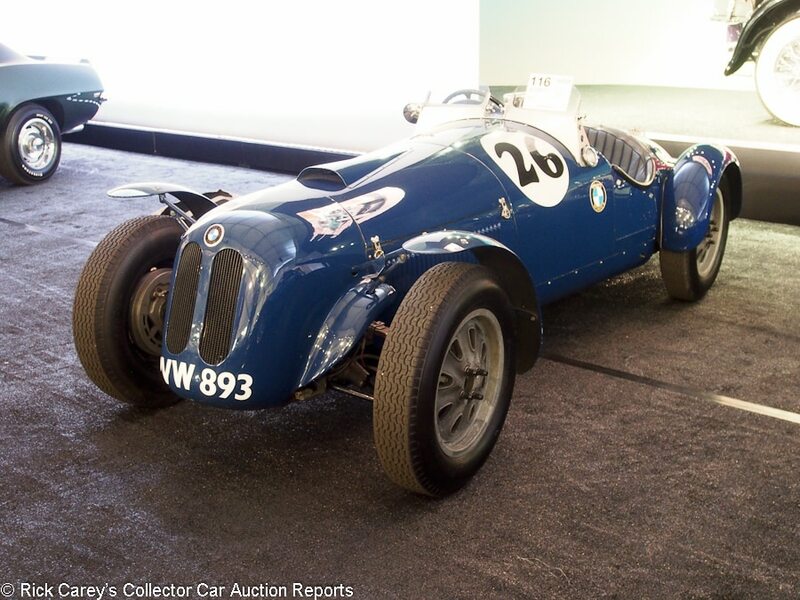 Lot # 116 1935 Frazer-Nash BMW 315/328 LMC Special Sports-Racing Two-Seater; S/N 51203; Engine # 100B24287; Dark Blue/Dark Blue leather; No top; Estimate $250,000 – $350,000; Competition car, original as-raced, 3 condition; With Reserve; Hammered Sold at $175,000 plus commission of 12.00%; Final Price $196,000. – RHD. Cycle fenders, 4-bolt 16-inch alloy wheels, dual aeroscreens, outside exhaust, no road lights. – Gradually developed and built up over the years into a road racing and hillclimbing special by Ron Willis. Raced by Willis and his son-in-law Charles Bulmer from the late 40’s through 1952, then by others until it fell into disrepair, its magnesium sheet custom body consumed by the elements. Eventually it was restored by Proby Cautley with aluminum repro bodywork and the Willis/Bulmer 2-liter BMW engine with 328 cylinder head and new LMC-style alloy wheels by Crosthwaite & Gardner. Recent U.S. historic race history. Decent paint and worn older upholstery. The rest of the car is aged and used but maintained. – Rarely does a special, even from the early post-war years in vehicle-starved Britain, have as long and colorful history as this, nor be as well maintained and presumably race-ready. It needs nothing except a thorough inspection for safety to be taken to the track to continue its notable history, a sound value at the price it brought here. Lot # 126 1959 Gemini MK II Formula Jr.; S/N 1009; White, Red nose and hood/Black; Estimate $35,000 – $55,000; Competition car, original as-raced, 5+ condition; No Reserve; Hammered Sold at $22,321 plus commission of 12.00%; Final Price $25,000. – 8-spoke alloy wheels, 38DCO3 carb, BMW 948cc engine, coil-over suspension front and rear. – A somewhat scrofulous barn find with peeling paint, surface rust and dirt. Perhaps mostly there but more of a resurrection than a restoration lies in its future. – Believed by the seller to be the second Gemini Mk II built, a model made famous by Jimmy Clark’s open wheel debut race in one at Goodwood in 1959. There was more than a little interest in it before the sale, but the block transaction fell apart and was completed later at this all-in price. It has serious potential, especially at this price, and should be a rewarding restoration project. Lot # 187 1927 Georges Irat Model A Cabriolet, Body by Pourtout; S/N 2773; Engine # 10769; Cream/Brown leather; Brown cloth top; Estimate $150,000 – $200,000; Concours restoration, 1- condition; With Reserve; Hammered Sold at $112,000 plus commission of 12.00%; Final Price $125,440. – Red wire wheels, Dunlop tires, dual rear spares, Lucidus headlights, driving lights and spotlight. – Excellent paint, interior and chrome. Beautiful burl wood interior trim and engine-turned instrument panel, burl wood interior trim, sunburst door panels. Displayed at the 1927 Paris Salon. Very sharp restoration completed in 1995 for Alan Melchior; 2005 Pebble Beach Class third, CCCA National First Prize. A handsome and very unusual automobile, carefully preserved and still show-ready with barely any age or use. – The only Georges Irat registered with the CCCA, well restored years ago and maintained in concours condition to this date. 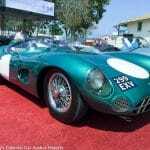 It was offered by Gooding & Company at Pebble Beach in 2006 where it was reportedly bid to $170,000. It may have only two liters and 80hp, but it has dramatic Pourtout coachwork with a low top and windshield that expresses its sporting character. Guaranteed to be unique wherever it appears and with decent performance for its era, the survival of its now nearly quarter-century old restoration is evidence of the quality of the workmanship and materials. The new owner has a rare car of unusual style in exceptional condition for a modest price. 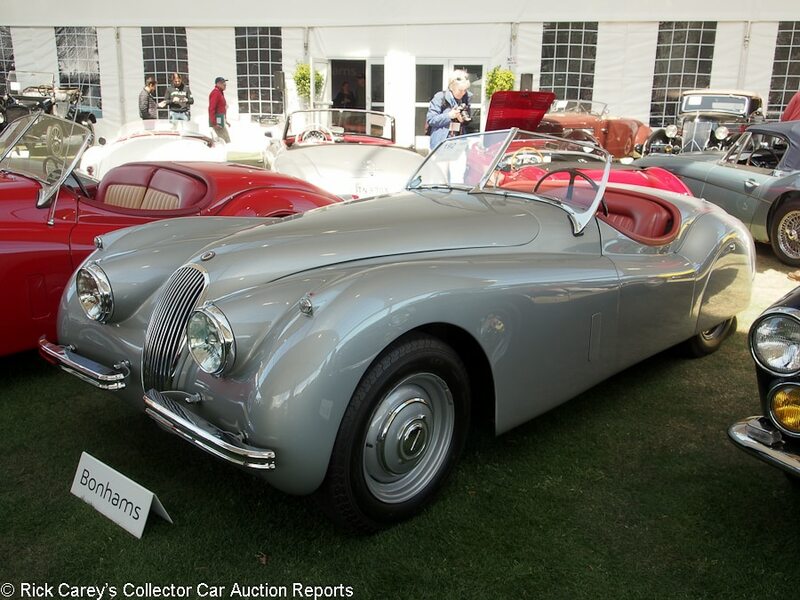 Lot # 192 1953 Jaguar XK 120 Roadster; S/N 674160; Engine # W93148; Grey/Dark Red leather; Black cloth top; Estimate $90,000 – $120,000; Cosmetic restoration, 3+ condition; With Reserve; Hammered Sold at $72,000 plus commission of 12.00%; Final Price $80,640. – Steel wheels, hubcaps, Avon tires, skirts, Lucas headlights. – Good older paint, chrome and interior. Once was restored like new, now has miles and looks like a three year old used car with some recent work to freshen it. – Sold by Bonhams at Fairfield, Connecticut in 2011 for $70,200 and is in slightly better condition today even though showing some 4,000 more miles on its odometer. This is a quality Jag at a realistic price. 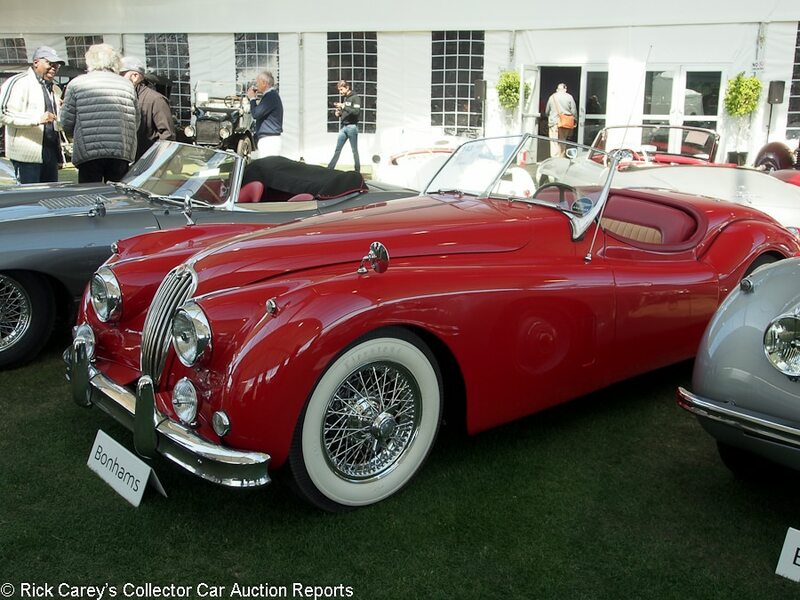 Lot # 143 1955 Jaguar XK 140MC Roadster; S/N S810834; Engine # G22508S; Red/Red, Biscuit leather; Black cloth top; Estimate $100,000 – $130,000; Cosmetic restoration, 3 condition; No Reserve; Hammered Sold at $82,000 plus commission of 12.00%; Final Price $91,840. 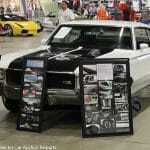 – Chrome wire wheels, whitewall tires, fog lights, Lucas headlights, fender mirrors, electric fan. – Good paint, interior and top, weak windshield frame chrome. The engine is shiny but the compartment it sits in and the chassis were lightly cleaned and repainted. Cosmetically restored to attractive driver condition. – The result here is realistic in an XK Jag market that has been declining in recent years but that does nothing to detract from its elegance and performance. 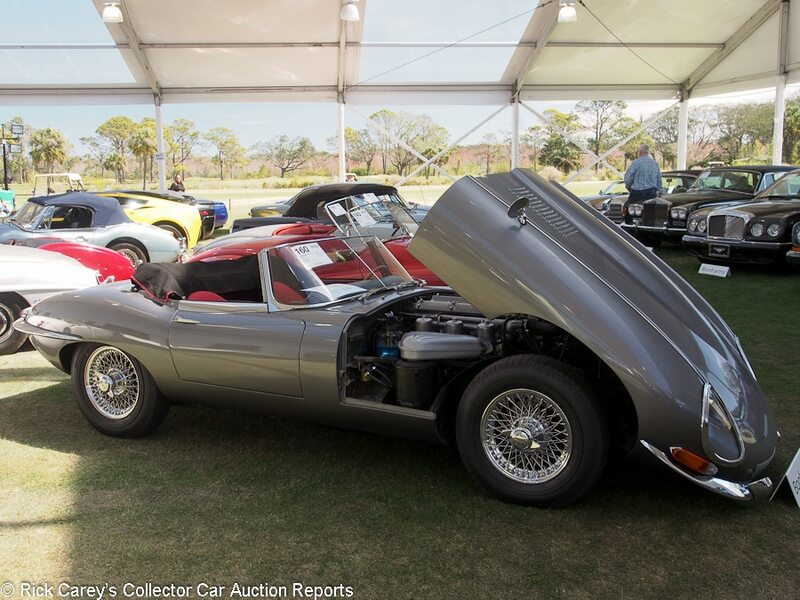 Lot # 160 1962 Jaguar XKE SI Roadster; S/N 877082; Engine # R43139; Metallic Grey/Red leather; Black cloth top; Estimate $100,000 – $125,000; Visually maintained, largely original, 3 condition; With Reserve; Hammered Sold at $90,000 plus commission of 12.00%; Final Price $100,800. – Chrome wire wheels, no name radial tires, woodrim steering wheel, palm-burner aluminum shift knob, no radio. – Good older paint, interior and top. The chassis and engine compartment have been cleaned up but are oily and old. There are many frayed original wires, The engine block, head and original data plate match. Paint is lifting along the back of the bonnet. One family owned from new, stored since 1994, and it shows even with the recommissioning mechanical work it has received recently. – The age of this E-type is compromised by the aged cosmetic restoration. The new owner has myriad ways to improve it, but none to make up for paying full retail for it. 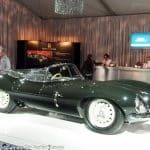 Lot # 180 1959 Kellison J-4R Coupe; S/N 3970020; White/Black vinyl; Estimate $35,000 – $55,000; Competition restoration, 3 condition; No Reserve; Hammered Sold at $25,000 plus commission of 12.00%; Final Price $28,000. – 406/497hp Chevy, M-21 4-speed, Corvette suspension, roll cage, fuel cell, 5-spoke alloy wheels, disc brakes, road legal equipment. – A full tilt boogie vintage race car originally prepared for Rich Taylor. Original Kellison chassis duplicated in high strength materials, NASCAR style cage, professionally prepped and very successful. Cosmetics to racer, not show, standards with chipped edges and clumsy retouches. SVRA logbook. – Sold by RM here in 2001 for $36,300 with limited subsequent work to make it street legal and pretty swoopy any way it’s looked at. It is by any standard a lot of performance for the money and will hold its own on track or on tour. 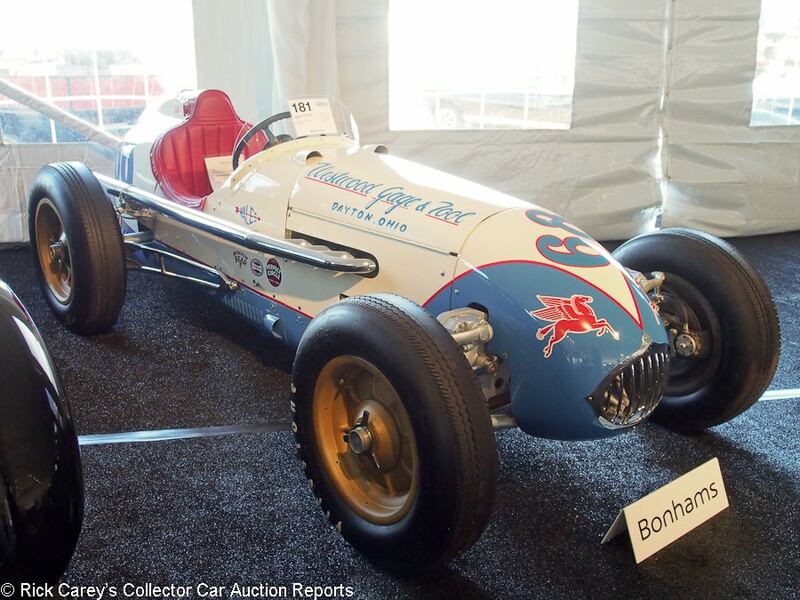 Lot # 181 1952 Kurtis KK4000 Indy Car; S/N 345; Engine # 158; White, Blue/Red leather; Estimate $275,000 – $350,000; Competition restoration, 2 condition; With Reserve; Not sold at Hammer bid of $210,000. – 270 Offy, 2-speed Meyer-Drake gearbox, hydraulic lever shocks, four-wheel disc brakes, Halibrand centerlock mag wheels, Firestone tires, Hilborn fuel injection, Joe Hunt magneto. – Raced at Indy 1952-1956 driven by Allen Heath, Pat O’Connor, Ed Elisian and Johnny Kay without a significant finish. Later sold to Buck Boudeman and never made into a sprint car. Almost all original bodywork. Excellent paint, chrome and interior. Clean, orderly engine compartment. All as it should be and invited to the Amelia Island Concours d’Elegance on Sunday (Saturday, as it turned out.) – The value of this Kurtis is all in its preservation and originality, not in its history which, other than misfortunes, is not distinguished, and it would not have been a surprise at all to have seen it sell for the reported high bid. 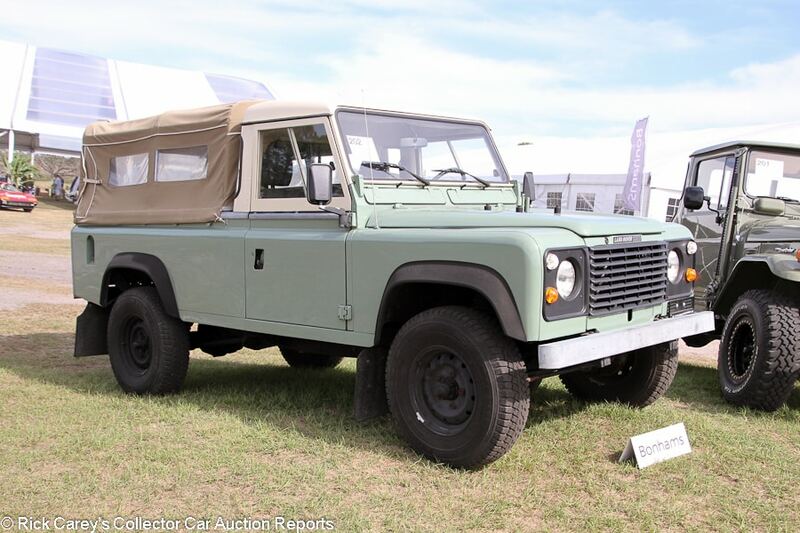 Lot # 202 1984 Land Rover Defender 110 Soft Top 4×4; S/N SALLDHAV2AA214347; Engine # 37A0034C; Seafoam Green, White roof/Black leather; Tan cloth top; Estimate $35,000 – $45,000; Cosmetic restoration, 3 condition; No Reserve; Hammered Sold at $28,000 plus commission of 12.00%; Final Price $31,360. – Store brand tires, cassette stereo, Holley carb. – Desirable soft top long wheelbase. Dull front bumper. Dirty, dull and oxidized original wheels. Original and tidy but unrestored underneath. Decent newer paint and top. Well-kept original interior. Some recent work done and in good shape, but far from perfect. A desirable configuration and not too good to enjoy off road. – Desirably configured, this driver quality 110 appears to have been restored as a working vehicle for its “CEO of a Swiss watchmaker” and sold for an appropriate number given its strengths and weaknesses. 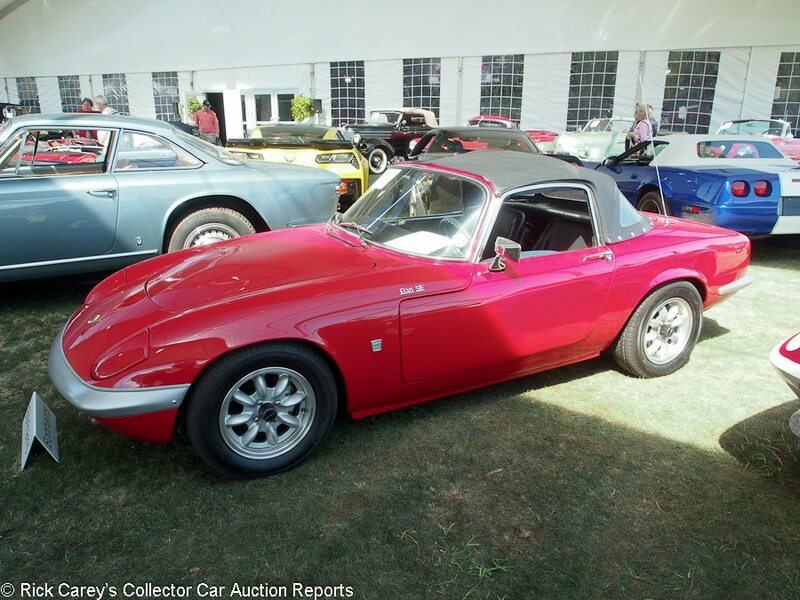 Lot # 138 1966 Lotus Elan S3 Roadster; S/N 455896; Red/Black vinyl; Black leatherette top; Estimate $30,000 – $40,000; Original, modified for competition or performance, 3 condition; No Reserve; Hammered Sold at $24,000 plus commission of 12.00%; Final Price $26,880. – 1,558/125hp Sprint-spec engine, Panasport alloy wheels, Achilles tires, leather rim steering wheel, Becker Europa II AM-FM. – SE-badged to reflect the uprated engine. Repainted assembled with a few small flaws and some masking issues. Four inch paint crack just above the front bumper. The doors hang out at the bottom. Good interior and top. A sound and attractive driver. – The bidders weren’t moved by the extra 20hp as much as this lightweight, crisp-handling Elan will be on the road giving the new owner extra performance in a largely original car for no premium at all. It’s a sound value for a driving-oriented new owner. Lot # 133 1956 Lotus Eleven Le Mans Series I Sports Racer; S/N Engine No. 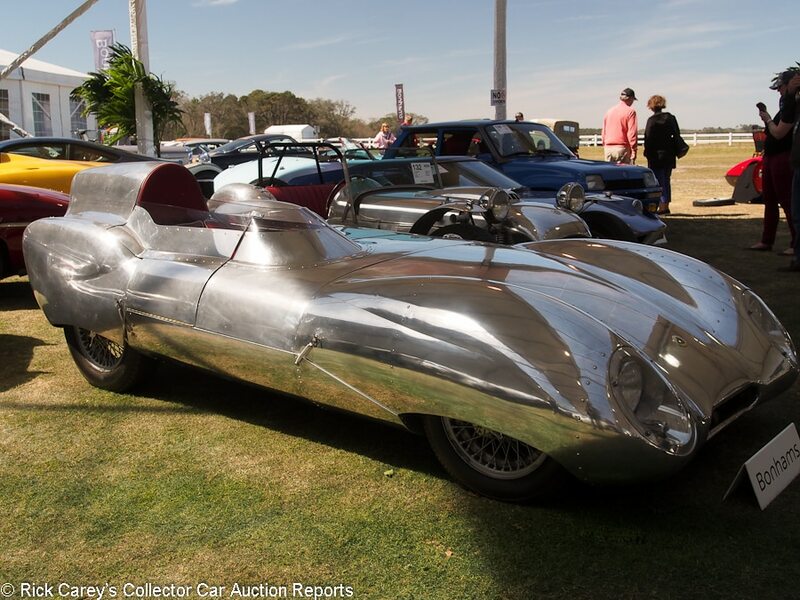 3863; Engine # 3863; Polished aluminum/Red leatherette; Estimate $100,000 – $125,000; Competition restoration, 3+ condition; With Reserve; Hammered Sold at $83,000 plus commission of 12.00%; Final Price $92,960. – RHD. 1,172/83hp Coventry Climax four, BMC 4-speed, Grey painted wire wheels, disc brakes, deDion rear axle, leather rim steering wheel, driver’s head fairing, passenger’s seat aluminum cover, wraparound windscreen. – Clean, orderly and workmanlike, a proper racecar rebuilt from a wreck with a reproduction nose and tail by Williams & Pritchard. Not used since restoration and will need attention. David Springett collection. – A spot-on result for this car’s condition and history, like its Lotus 6 stablemate sold just before it the work needed to get it back on the road or track is straightforward and readily accomplished at the price paid here without being burdensome on its value. 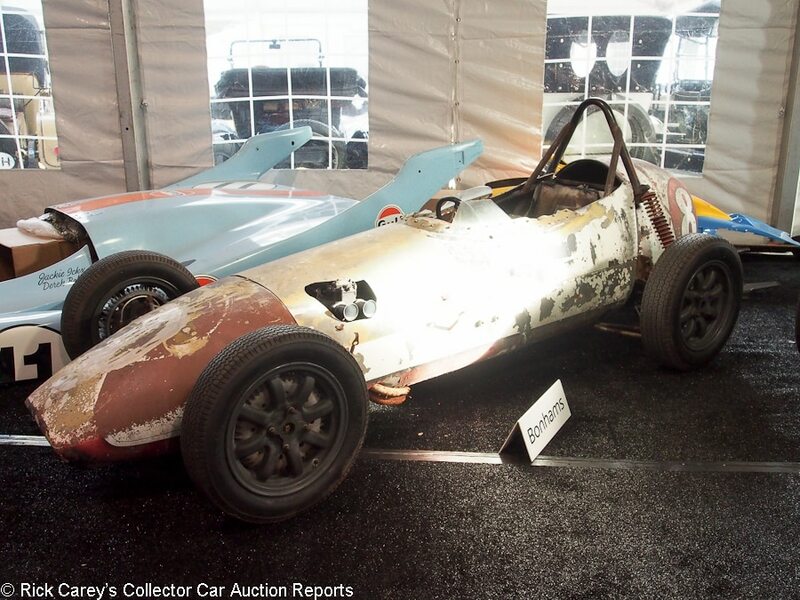 Lot # 132 1954 Lotus MK6 Roadster; S/N Mk695; Engine # D21815AD; Polished aluminum/Red vinyl; Black vinyl top; Estimate $50,000 – $70,000; Competition car, original as-raced, 3 condition; No Reserve; Hammered Sold at $27,000 plus commission of 12.00%; Final Price $30,240. – RHD. 1,292/50hp MG TA engine, 3-speed, wide pattern steel wheels, Dunlop tires, side exhaust, rollbar, rear-mounted spare, Lucas headlights, cycle front fenders, clip on fully skirted rear fenders, woodrim steering wheel, top and side curtains. – Restored some time ago in the UK by Len Pritchard of Williams & Pritchard. Scraped but thoroughly polished body, good older interior, clean guages. Not pristine, but maintained and a standout car in its polished aluminum although unused for some time with attention warranted before use. David Springett collection. – The first ‘production’ series Lotus of which about 110 were built, it could hardly be a better value even needing comprehensive attention before hitting the road or track. It should be a straightforward project and could be back in use in the coming driving season while also being worth considerably more than it brought here. It is an astute acquisition. 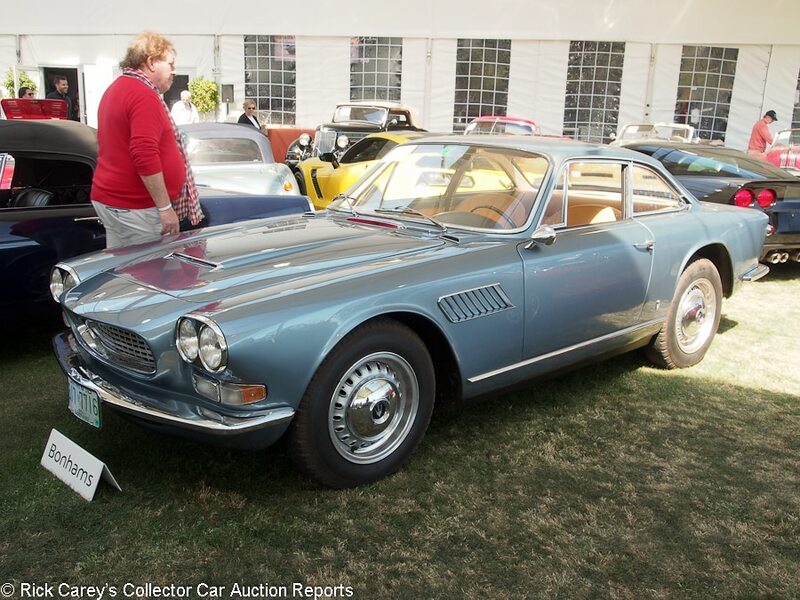 Lot # 111 1965 Maserati Sebring II Coupe, Body by Vignale; S/N AM10110103; Engine # AM10110103; Azzurro Vincennes/Beige leather; Estimate $275,000 – $325,000; Visually maintained, largely original, 3 condition; With Reserve; Hammered Sold at $222,000 plus commission of 12.00%; Final Price $248,640. – 3,694/255hp, Lucas FI, 5-speed, steel wheels, hubcaps, Pirelli tires, Blaupunkt multiband radio, 5-speed, Personal steering wheel, air conditioning. – Decent paint, interior and chrome. The engine compartment and chassis are unrestored, oily and have peeling old paint and undercoat. Presentable but not restored. – This is a Maserati enthusiast’s car, luxuriously outfitted and lovingly preserved with attention as needed. With Ferrari PF coupes of the era bringing three times more this is Sixties Italian Gran Turismo at its most cost-effective and a realistic value at this result. 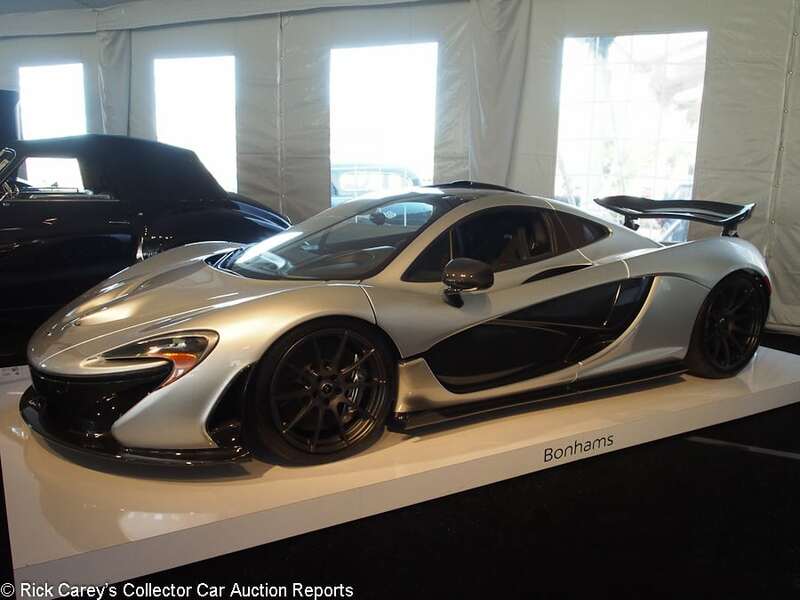 Lot # 164 2015 McLaren P1 Coupe; S/N SBM12ABA7FW000343; Supernova Silver, Black carbon fiber/Black Alcantara, Red leather inserts; Estimate $1,800,000 – $2,000,000; Unrestored original, 2 condition; With Reserve; Hammered Sold at $1,550,000 plus commission of 10.32%; Final Price $1,710,000. – Wide driver seat, custom upholstery with P1 headrest logos, 6-point belts, satin lacquer finish, all factory delivery items. – 360 miles and like new. – The technological marvel expected from McLaren, at a McLaren-esque price, but 650s and 720s are a dime-a-dozen compared with the 375 P1s built and this might even be considered bragging rights at a modest cost. Lot # 197 1958 Mercedes-Benz 190SL Convertible; S/N 1210428500996; Engine # 1210103820888; Silver/Red leather; Black cloth top; Estimate $100,000 – $125,000; Visually maintained, largely original, 3- condition; With Reserve; Not sold at Hammer bid of $72,000. – Clock, no radio, hubcaps, trim rings, Continental tires, Solex carbs. – Replacement engine. Repainted with some new chrome, otherwise tired, dirty and original. The original leather is heavily surface cracked. The paint must have been truly awful to result in a repaint. No evidence of any material body filler, though. – An unappealing car that despite (or on account of) its originality is waiting for a comprehensive restoration that the 190SL market today can’t justify. It will have to sell for a lot less than this to be an economic proposition. 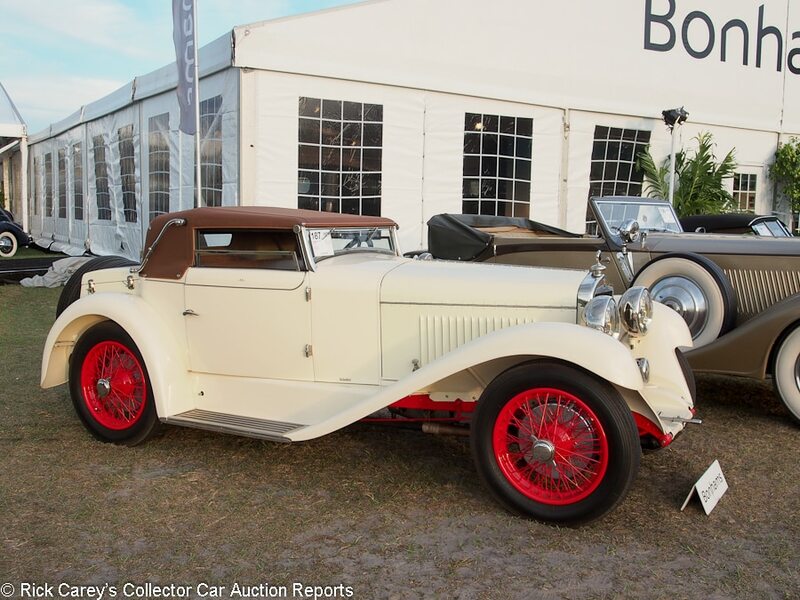 Lot # 185 1961 MG A 1600 Roadster; S/N 89089; English White/Red; Estimate $35,000 – $45,000; Modified restoration, 3+ condition; No Reserve; Hammered Sold at $32,500 plus commission of 12.00%; Final Price $36,400. – Painted centerlock wire wheels, store brand radial tires, Moto-Lita woodrim steering wheel, front disc brakes, cutdown full windshield, no bumpers. – Engine built to 110hp. Dull switchgear but mostly good interior. Decent older paint with a big chip at the front of the driver’s door. Uneven gaps. Dull chrome and brightwork. Lightly and tastefully upgraded, and not too good to drive hard and enjoy. A solid, peppy driver. 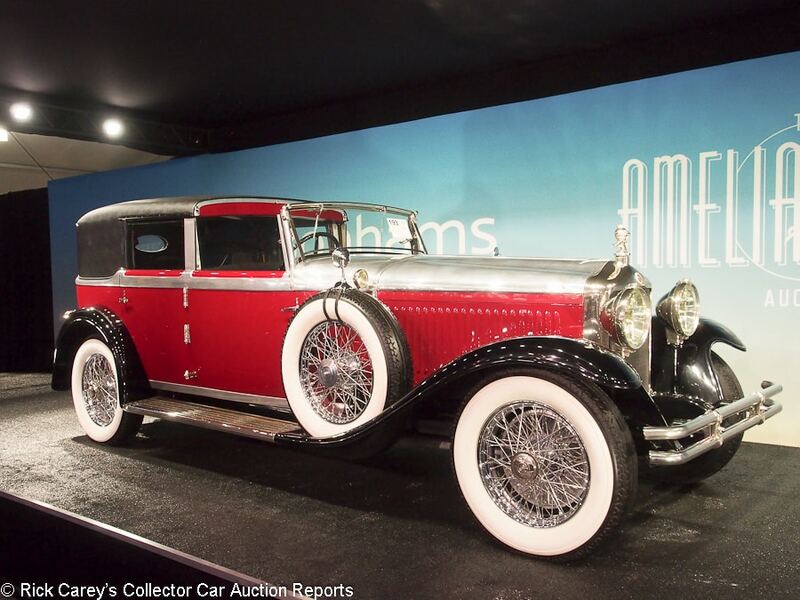 – Sold for $37,400 at Gooding Pebble Beach in 2012. 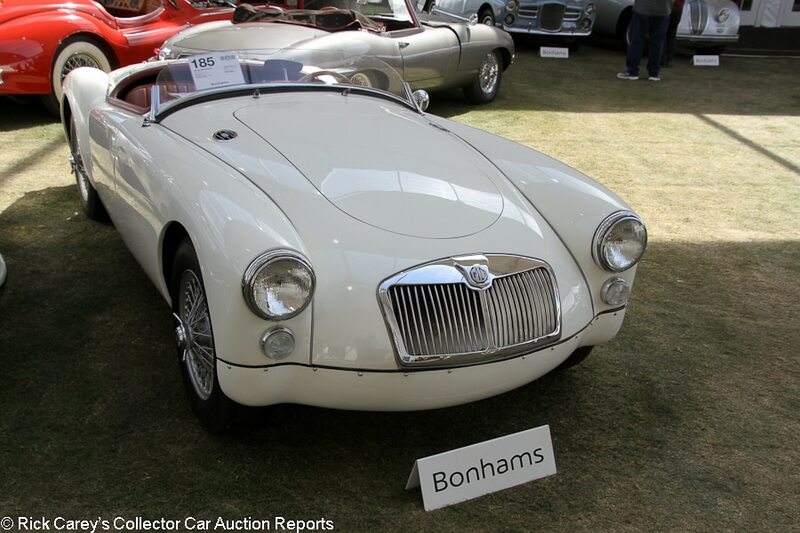 MGA prices aren’t much different from what they were back then and the car looks to have neither been driven a lot (the odometer shows only 262 more miles) nor had significant work recently, so the transaction makes sense in a largely static market. 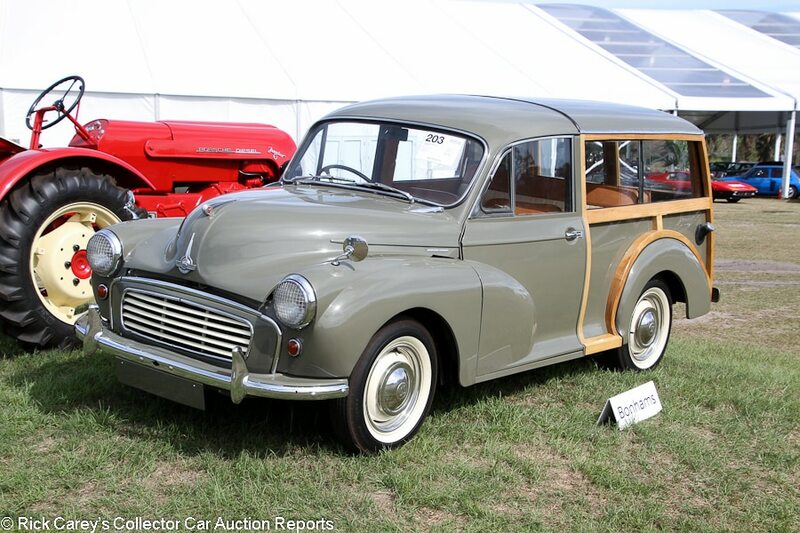 Lot # 203 1963 Morris Minor 1000 Deluxe Traveler; S/N MAW3RD1036385; Engine # 332944; Green, Wood/Brown, Beige; Estimate $20,000 – $25,000; Enthusiast restoration, 3 condition; No Reserve; Hammered Sold at $19,000 plus commission of 12.00%; Final Price $21,280. – 1,098/48hp, 4-speed, hub caps and trim rings, dual wing mirrors, banjo steering wheel. – Slightly grimy but maintained engine bay. Average quality older paint with light orange peel and microblisters in spots. The wood is presentable but a little rough to the touch and not perfect. Quickly sprayed undercoating. Very good interior aside from a quickly painted dash and original steering wheel. A cute car that will certainly get a lot of admiration and compliments, but fundamentally just a driver. – A lot of charm for the money and arguably the most desirable variant of the old Morris Minor, but at this price the new owner doesn’t have anything left to put any significant work into it and will have to either just enjoy it casually or embark on costly restoration work that will turn the Traveler into a submarine. 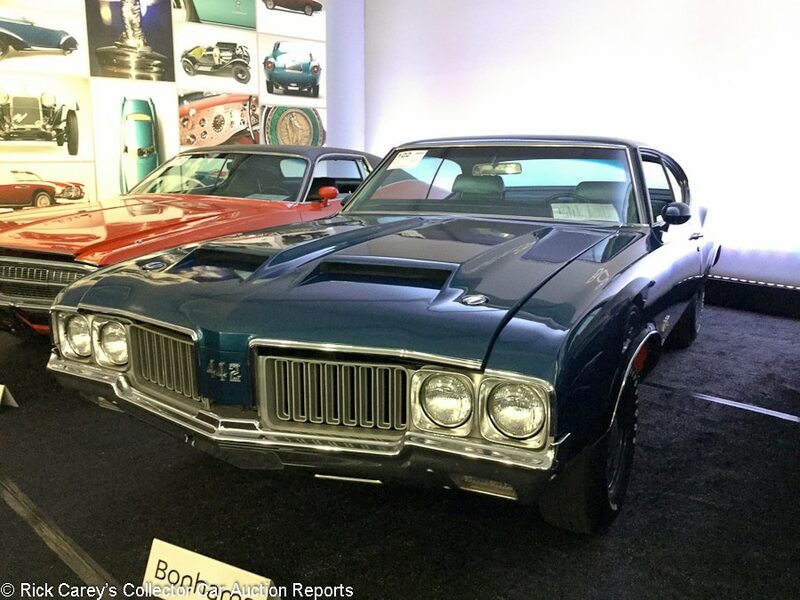 Lot # 122 1970 Oldsmobile 4-4-2 W-30 2-Dr. Hardtop Holiday; S/N 344870M182832; Twilight Blue, Black Stripes/Blue vinyl; Estimate $30,000 – $50,000; Unrestored original, 2- condition; No Reserve; Hammered Sold at $66,000 plus commission of 12.00%; Final Price $73,920. – 455/370hp, 4-speed, Hurst shifter, body color wheels with hub caps, Firestone wide oval tires, AM radio, bucket seats, power front disc brakes. – The paint has several chips on the hood and the front bumper has several nicks and scratches. The underbody is aged, and is generally clean with a new exhaust system. The interior has been well cared for and does not show any noticeable wear. An exceptionally well preserved example that is hard to believe hasn’t been restored in any way. – Sold by Mecum in Dallas from Jim Fasnacht’s collection in November 2016 for $110,000, a heady price even coming from a well-known and fastidious collector. Its result here, however, is even further on the bargain side of reasonable, with no premium for originality at all and a big discount for age. It could have brought closer to, if not in excess of, $100,000 without being unreasonable. It is a bargain at this result. 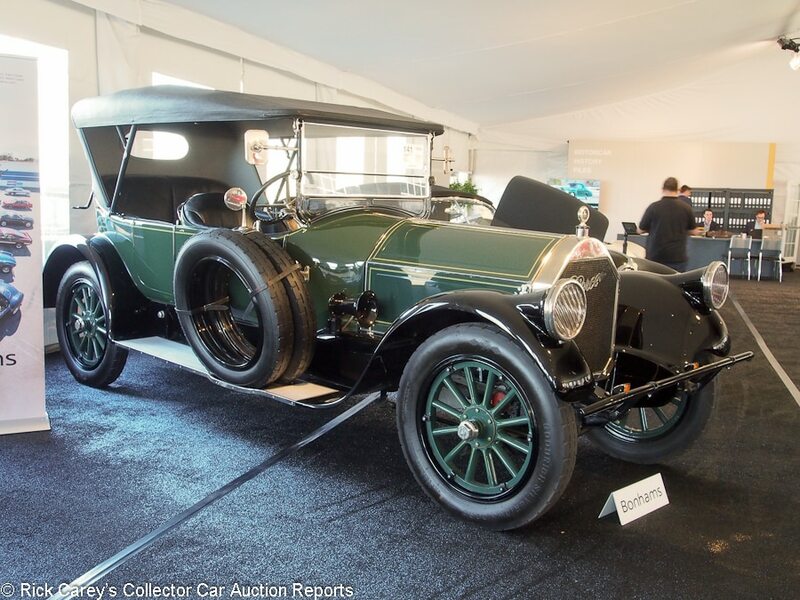 Lot # 141 1919 Pierce-Arrow Series 51 4-Passenger Touring; S/N 514350; Engine # 514498; Dark Green, Black fenders/Black leather; Black leatherette top; Estimate $250,000 – $350,000; Older restoration, 3+ condition; With Reserve; Hammered Sold at $250,000 plus commission of 12.00%; Final Price $280,000. – RHD. 524/75hp T-head six, 4-speed, body color wood spoke wheels, Goodrich tires, dual right side spares, Waltham speedometer and clock, turn signals, Dawley headlights. – Very good older paint with a few small chips and scrapes. Good interior, gauges, top and nickel trim. Paint is lifting all along the back of the hood sides. Chassis and engine are orderly and clean but a little oily and used. A proud and capable tour car. – Put the tall top down and fold the windshield on this magnificent Pierce and it becomes something entirely different in appearance, a sleek, stylish low-bodied sporting 4-seater with performance to match. Bonhams Evan Ide enthused about its power. With looks, performance and a well-maintained older restoration it is ideal for long distance tours where drivers of modern cars will be mystified by its highway performance and it is a sound value at this price. 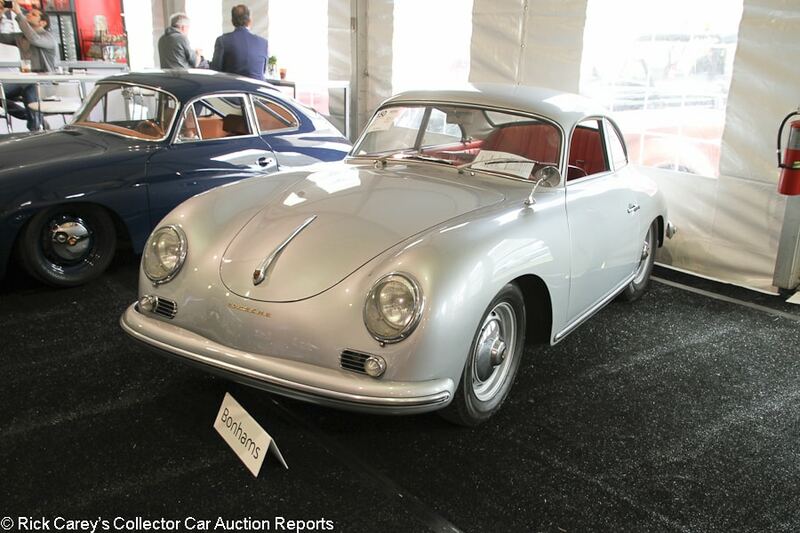 Lot # 150 1958 Porsche 356A 1600 Super Coupe, Body by Reutter; S/N 102429; Engine # 81727; Silver/Red; Estimate $80,000 – $100,000; Older restoration, 3+ condition; No Reserve; Hammered Sold at $75,000 plus commission of 12.00%; Final Price $84,000. – Hub caps, Dunlop tires, replacement 1958 Super 90 engine. – Chip on the hood and a small dent in the left headlight bezel. Dull, lightly scratched brightwork. Lightly pitted window frames. Good seats, but aged dash and steering wheel. Has been an event car in the past, and is still perfectly suited to that. – Bought here at a price appropriate for the standard engine with which it was built, the new owner got better performance for no premium. 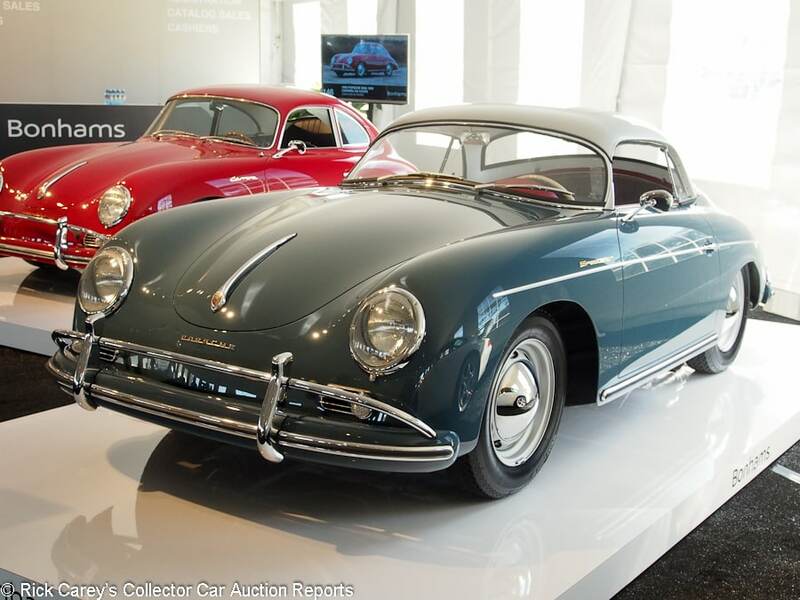 Lot # 113 1957 Porsche 356A 1600 Super Speedster, Body by Reutter; S/N 83543; Engine # 66130; Aquamarine Blue, Silver hardtop/Red leather; Black cloth top; Estimate $450,000 – $550,000; Recent restoration, 1 condition; With Reserve; Hammered Sold at $400,000 plus commission of 11.25%; Final Price $445,000. 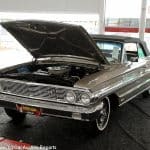 – 1582/60hp, two tops and full weather equipment, hubcaps, Vredestein tires, bumper overriders, Porsche CoA and Kardex documented, owner’s manual, tool bag. – Gorgeous paint, chrome and interior. A fresh, February 2018, spectacular restoration to better than new condition. Represented to be the matching numbers engine and original body panels. It doesn’t get much better than this in a Porsche Speedster. – It never left Stuttgart with body panels as flat as this or as consistently fit throughout the car. Better than new throughout, with both a hardtop, soft top and side curtains, this is the 356 Speedster to own and drive (carefully and) proudly and it was bought at a responsible price. 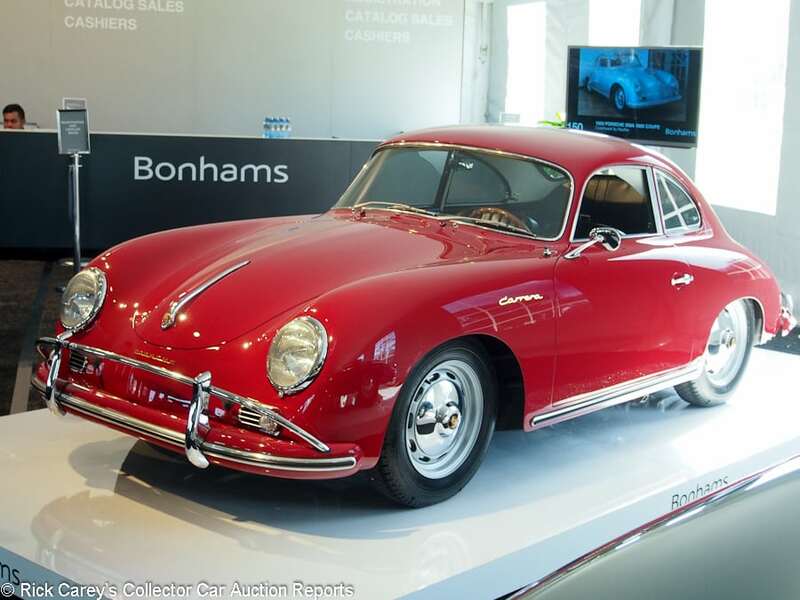 Lot # 146 1959 Porsche 356A Carrera GS Coupe, Body by Reutter; S/N 105578; Engine # P93047; Red/Black; Estimate $650,000 – $750,000; Recent restoration, 2+ condition; With Reserve; Hammered Sold at $570,000 plus commission of 10.88%; Final Price $632,000. – 1,587/104hp 4-cam Typ 692/2 engine, 4-speed, 80 liter fuel tank, silver wheels, hubcaps, Michelin XZX tires, no radio, Nardi woodrim steering wheel, bumper overriders. – Represented as the numbers-matching engine, transmission and body panels. Excellent paint, chrome and lightly worn interior despite being restored in the 1990’s. The engine compartment and underbody are like new. Done to high standards without going too far and magnificently preserved since restoration. – 4-cam Porsche Carreras were usually raced through at least one and sometimes several engines and the survival of one like this with its original engine, gearbox and body panels is nearly miraculous. It could have brought the low estimate on the hammer without being expensive, even with the now two decades old restoration, and in this transaction is a rare value for the new owner. 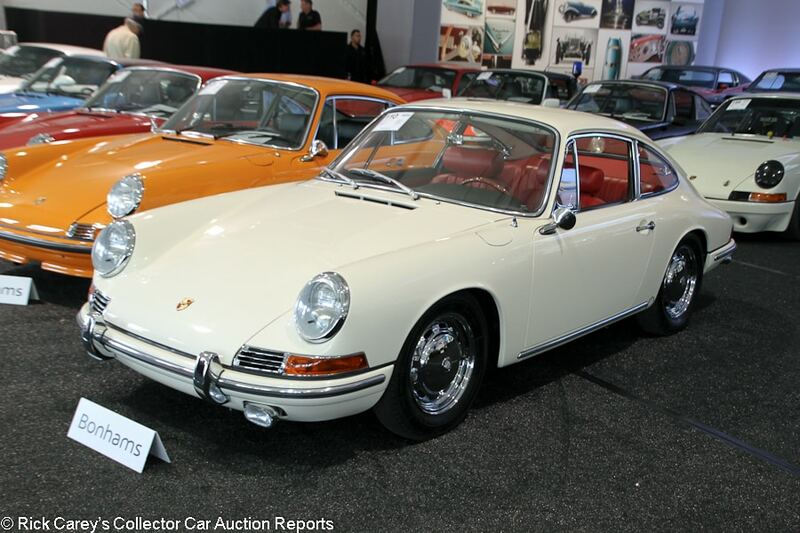 Lot # 110 1965 Porsche 911 Coupe; S/N 301327; Engine # 901407; Light Ivory/Red vinyl; Estimate $180,000 – $240,000; Recent restoration, 2+ condition; With Reserve; Hammered Sold at $185,000 plus commission of 12.00%; Final Price $207,200. – 5-speed, chromed steel wheels, fog lights, wood dash, Blaupunkt AM/FM stereo, gold brightwork. – Matching numbers. Delivered new as a demonstrator for Bob Holbert. There is a small dent in the exhaust tip, but the car was immaculately and recently restored. A very good first year 911. – These cars aren’t quite worth what they were in the months around the 911’s 50th anniversary, but they still remain quite expensive. This car sold toward the very top of current ’65 911 prices, and it deserved to. Given a sound California swb 911 2.0 for free it would be nearly impossible to restore it to these standards for the price it brought here. 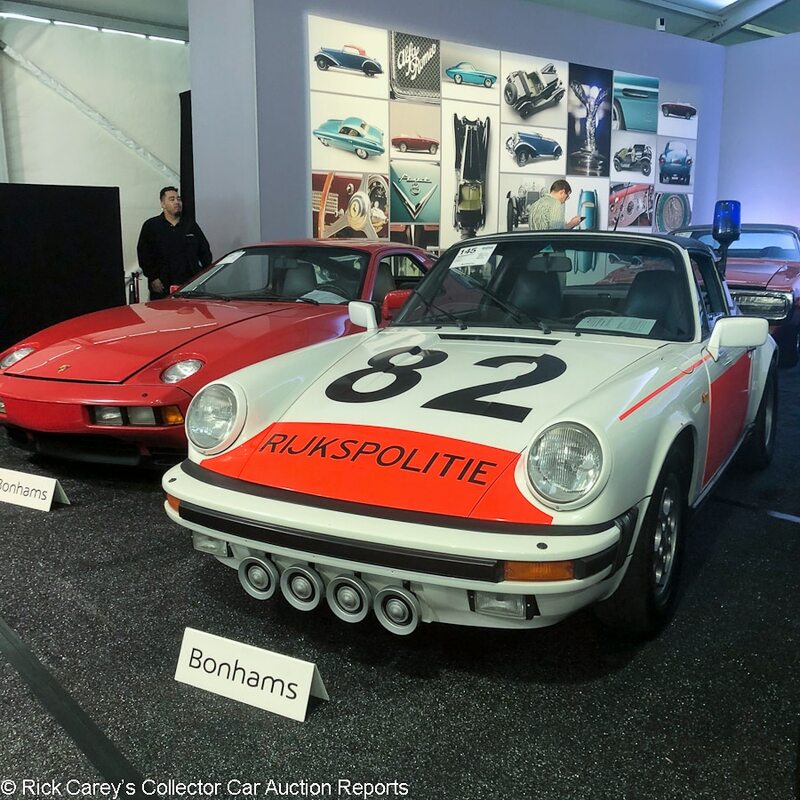 Lot # 145 1988 Porsche 911 Carrera 3.2 Targa ‘RIJKSPOLITIE’; S/N WP0ZZZ91ZJS140403; Engine # 64H03560; White, Orange/Black; Estimate $100,000 – $130,000; Unrestored original, 3 condition; No Reserve; Hammered Sold at $75,000 plus commission of 12.00%; Final Price $84,000. – Dutch police car with phone dial wheels, Pirelli P6000 tires, power windows, sirens, blue gumball light, rear-mounted loudspeaker. – Replacement engine. Some paint blemishes here and there. Very lightly worn interior for the mileage. Some wear and dirt. The headlight bezels aren’t quite straight. Little things to pick on, but very well kept for the most part, especially for a police car showing 251,949 km. Seems to have avoided any high speed chases. There are worse things to be hauled off to jail in. – Lucky Dutch police officers started using Porsches all the way back during the days of the 356. This later 3.2 Carrera sold for way more than a standard car in this condition would bring, but the novelty and charm of this car was undeniable and hard to resist. Only rarely, even at Porsche meets, will another one like it be seen to detract from its attention and its usefulness as the pace car at Porsche events is another bonus. 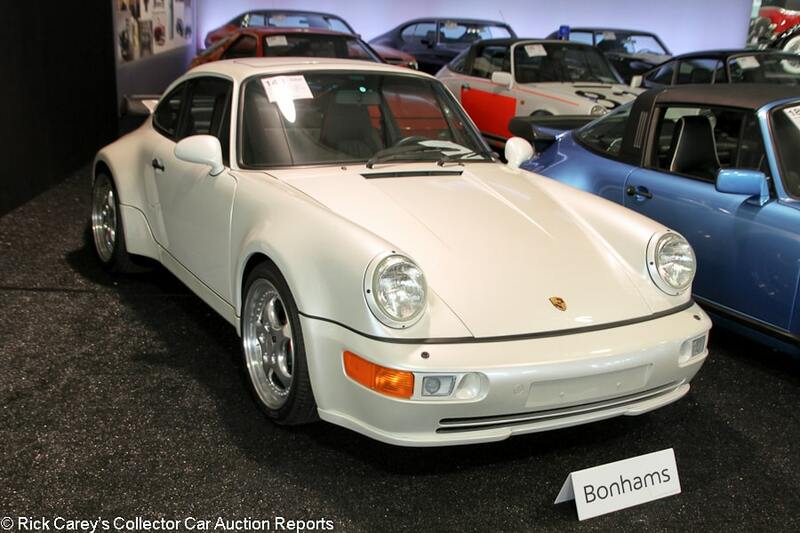 Lot # 140 1992 Porsche 911 Turbo Coupe; S/N WP0AA2963NS480308; Engine # 61N01407; Pearl White/Black leather piped in Red; Estimate $275,000 – $325,000; Unrestored original, 2 condition; With Reserve; Hammered Sold at $308,000 plus commission of 11.62%; Final Price $343,800. – Speedline wheels, Yokohama tires, sunroof, wood shift knob, wood dash, air conditioning. – ‘Paint to Sample’ pearl paint is gorgeous. Well optioned and showing 721 miles represented as all it has covered from new. A pretty special car, even in a weekend flooded with 964s. – The first really expensive 911 of the week to cross the block, this car hit it out of the park thanks to its special order features and before any 911 fatigue set in among the bidders (which, for the most part, it didn’t). This result is top dollar and then some and something of a shame that it has just sat for a quarter of a century without being driven. 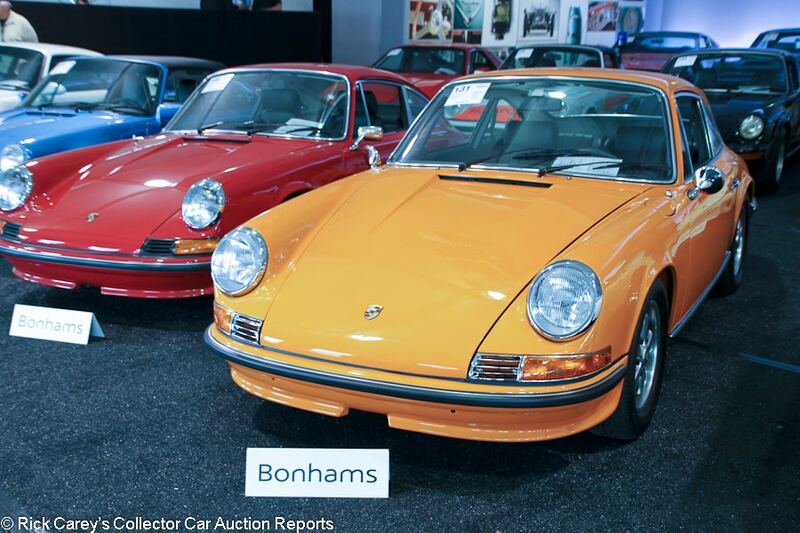 Lot # 131 1970 Porsche 911S 2.2 Coupe; S/N 9110301037; Signal Orange/Black leatherette; Estimate $175,000 – $225,000; Recent restoration, 2+ condition; No Reserve; Hammered Sold at $177,000 plus commission of 12.00%; Final Price $198,240. – 2,195/180hp, 5-speed, Fuchs wheels, Blaupunkt AM/FM stereo, Fuchs spare wheel, jack, tool kit. – 33,319 miles from new, restored by Brumos Porsche and completed in 2014, represented as the fully numbers-matching the Porsche CofA. Very good interior. Very good paint. Tidy and fresh underneath. A multiple show winner. – Further proof that people did not get their fill of 911s in Amelia Island this year. Sold for top dollar and deservedly so. 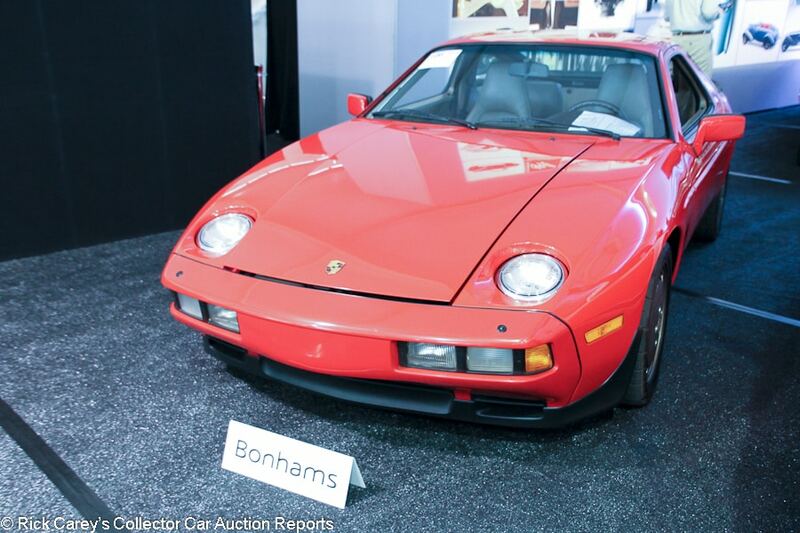 Lot # 196 1986 Porsche 928S Coupe; S/N WP0JB0922GS861083; Guards Red/Beige and Chocolate leather; Estimate $40,000 – $50,000; Original, with major mechanical repairs, 3- condition; No Reserve; Hammered Sold at $45,000 plus commission of 12.00%; Final Price $50,400. – 4,957/288hp, 5-speed, limited slip, sport shocks, Potenza tires, sunroof, Blaupunkt cassette stereo, power windows, power seats, air conditioning. – Recently pulled out of long-term storage and overhauled but mostly original and showing 33,432 miles. Very dull, lightly scratched original paint. Tidy underneath. The wheels and tires are a bit dirty. Dull exterior plastic. Lots of chips on the mirrors. The rub strip on the driver’s door is a bit loose. Very good interior that shows only very light wear to the seats and is much better than the exterior would lead you to expect. Represented as mechanically gone through after fifteen years of storage but with original paint. – While a lot of work went into sorting this car out mechanically, a good low-mile 928 isn’t exactly a once-in-a-lifetime opportunity and the price paid here for a good but imperfect example is excessive. If it isn’t, it is heralding a renaissance for 928s, one that seems unlikely even for low mileage examples. 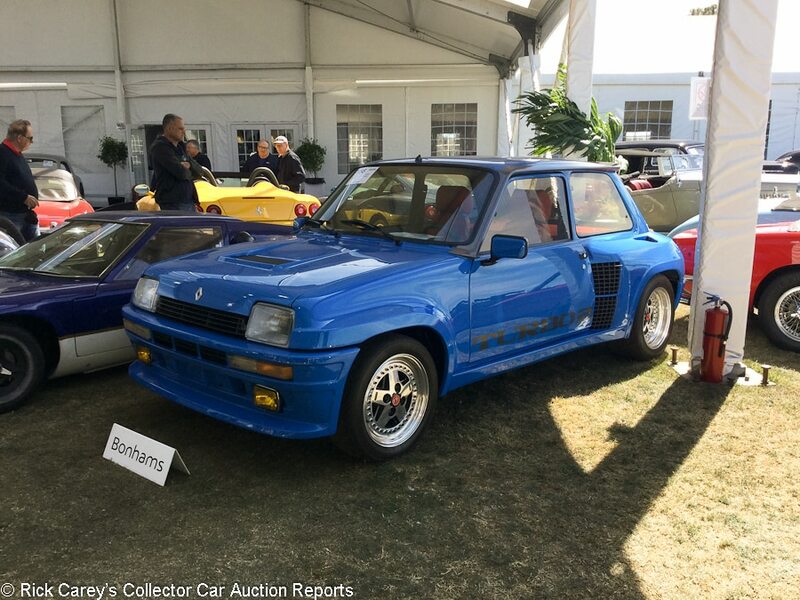 Lot # 158 1983 Renault R5 Turbo II Hatchback; S/N VF1822000D0000912; Electric Blue/Red leather; Estimate $120,000 – $150,000; Visually maintained, largely original, 2- condition; No Reserve; Hammered Sold at $110,000 plus commission of 12.00%; Final Price $123,200. – Gotti modular alloy wheels, Toyo tires, Momo steering wheel, Alpine stereo added, air conditioning. – Very good paint and body, although the roof trim has some cracking and paint chips and the chin spoiler has debris in the paint. Underneath, the chassis is clean but aged with minor oxidation. The interior is very good with some wrinkling to the driver’s seat. Showing 67,984 km. A well-kept Turbo II, original other than a repaint and mechanical work as needed. – These cars are less rare and sophisticated than the Peugeot 205 T16, but follow a similar rally-bred mid-engine hot hatch Formula and aren’t worth all that much less. This one sold at Bonhams Quail Lodge in 2016 and 774 km ago for $132,000, which was a strong result at the time. This result may be less, but it’s still fair for a Turbo II in this condition. 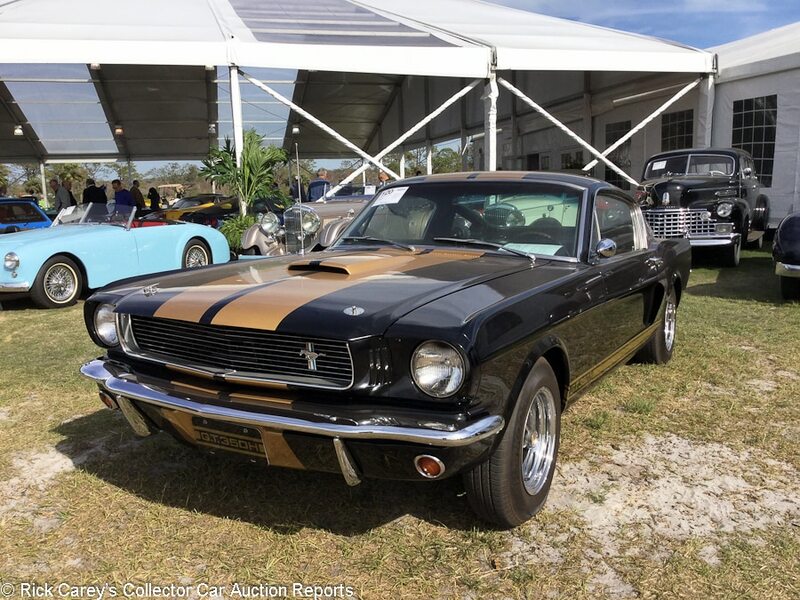 Lot # 120 1966 Shelby Mustang GT350H Fastback; S/N 6S1995; Black, Gold Stripes/Black; Estimate $90,000 – $125,000; Modified restoration, 2- condition; With Reserve; Hammered Sold at $82,000 plus commission of 12.00%; Final Price $91,840. – Upgraded to a 5-speed transmission from its original automatic, Magnum 500 wheels with Hankook tires, AM radio, dash mounted tach, high ratio diff (original included). – Replacement ‘correct date-coded 289 Hi-Po engine’. The paint is decent with some swirling from polishing, the engine and mechanicals have some wear from use and the interior is well sorted. Restored about 10 years ago. A well-presented Shelby with driver’s upgrades. 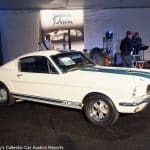 – The modifications and replacement engine imposed a stern discount on this otherwise well restored and maintained GT350H, a car that would normally be well into 6-figures. The result is appropriately priced for what it represents historically but a good value for its road driving appeal. 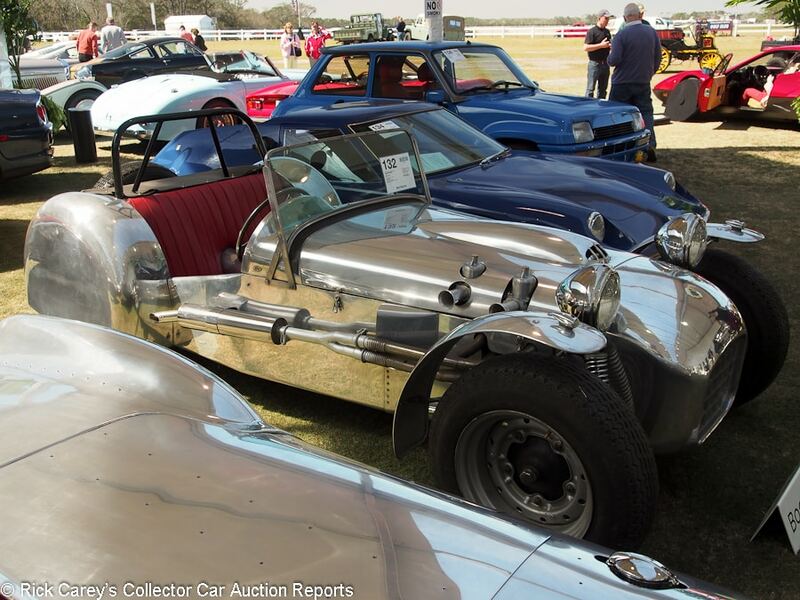 The bidders, auction house and consignor were insightful and the new owner is going to have a lot of fun, especially when dropping it into fifth on the open road. 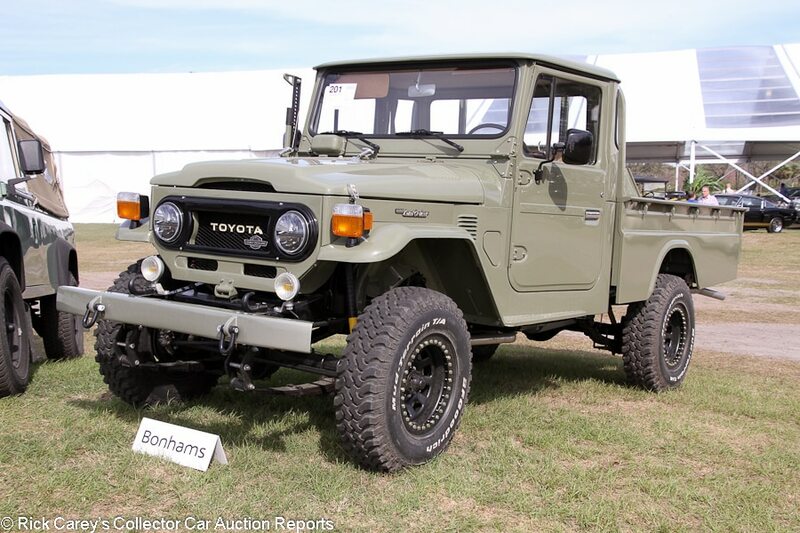 Lot # 201 1978 Toyota HJ45 Land Cruiser Pickup 4×4; S/N HJ45022928; Grayish Green/Saddle piped in Black; Estimate $65,000 – $85,000; Older restoration, 2- condition; No Reserve; Hammered Sold at $41,000 plus commission of 12.00%; Final Price $45,920. – 3,576/95hp 6-cylinder Diesel engine, 4-speed, fog lights, later digital stereo, LED headlights, 2″ lift, modular deadlock wheels. – Body-off restored by Legacy Overland. Leather interior. Restored but a little dirty underneath. Very good paint. Straight bed. Very good interior. Fully redone and attractive, but used a bit. Nevertheless, the work was by professionals and better than many FJs, plus some tasteful refinements. – Oddball Land Cruisers keep appearing from the depths of Central American estancias with metric instruments and diesel engines. Restored to fine condition like this, they have largely satisfied a craving reflected a few years ago in six-figure prices. The restoration margins have plunged, but at prices like this are still profitable. Expect to see more of them.